A perfect fit in Shirley Temple’s hand & foot prints, Hollywood, 1976. We are home after an amazing two week odyssey! We might be a day later than planned, and out of money, but we have recharged and made family memories that will last a lifetime! We awoke before 8am EST to a bright, clear, sunny but cold day in Salem, and started to pack up the van with all of our things. When D’Arcy went to start it so it would be warm to transfer sleeping girls, he discovered that the battery was dead again! Kate was getting ready to leave for work, so we waited a few minutes until she left,so D’Arcy could coast out of their driveway and Willem could use his truck to give us a boost. We figured we’d probably have to stop along the way to get a new battery, and planned to drive as far as we could without stopping – just in case! At -14*C, we made the decision before we left to drive through Houlton and Fredericton, rather than Route 9 to Saint John like we did on our way. Going through Houlton means interstate and divided highway most of the way. The girls did not want to leave and were quite cranky as we loaded them in to the car. 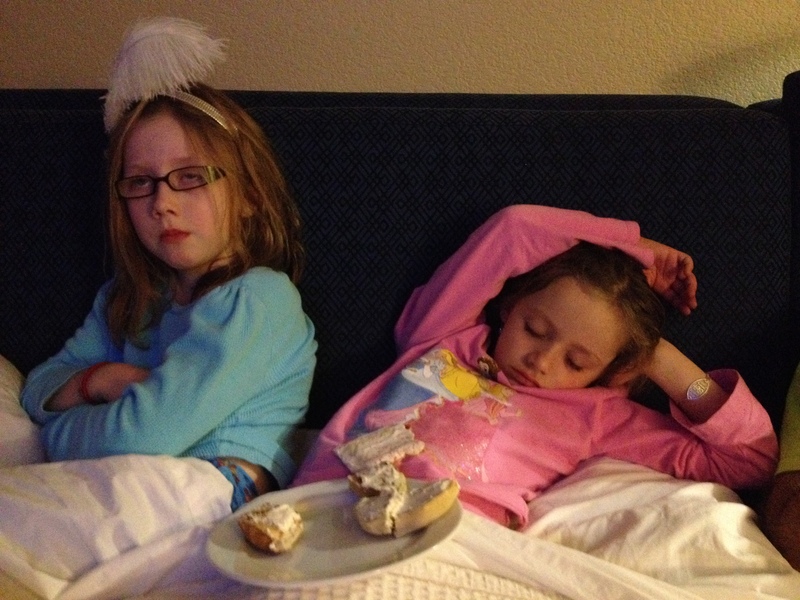 They even refused to participate in the family dance party as we drove out of Boston, but were soon back to sleep. We drove as far as Portland, Maine, before stopping so I could run in to a grocery store and restock the cooler for the drive. 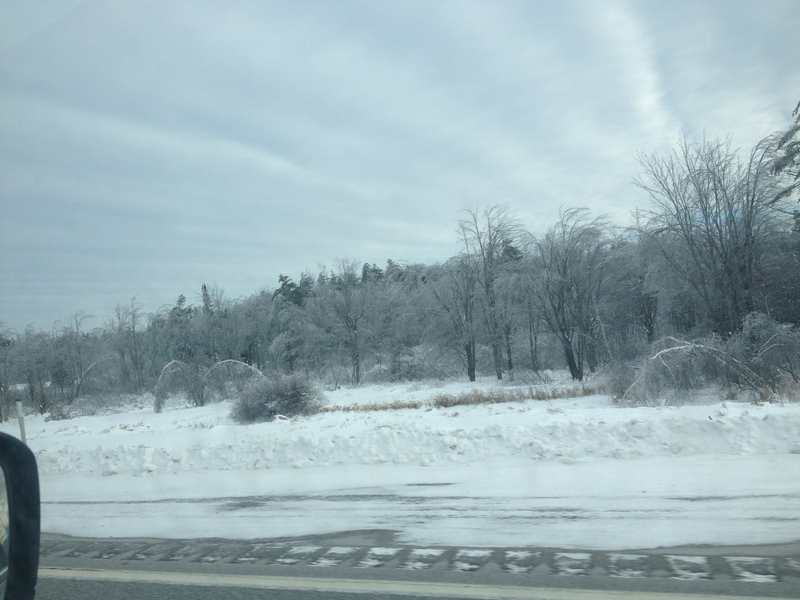 Some of the trees in Maine were bent under the weight of the snow from the storm. 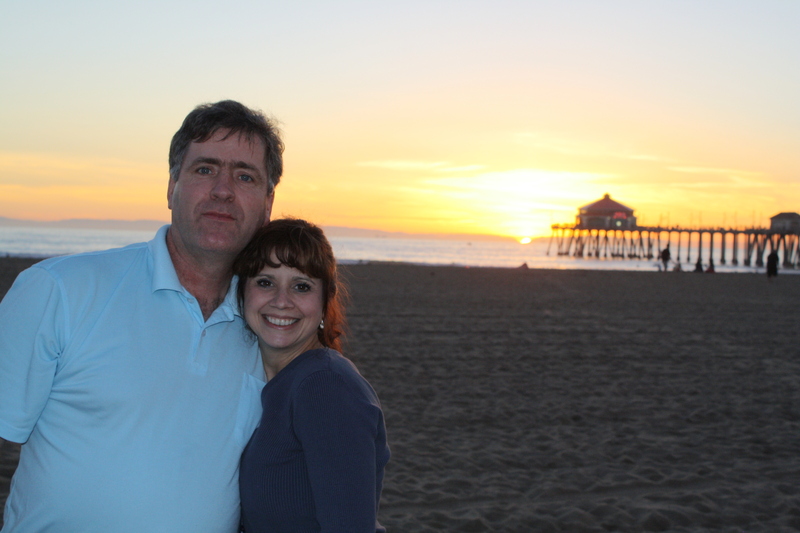 Travel pros – happily reunited with Caroline! (Only looking slightly worse-for-wear after 11 hours in the van!) Thank you cousin Neil for keeping Caroline alive and happy while we were away! Since we’ve been on our journey and posting about it on social media, I have had a couple of friends contact me to say they had thought about doing a similar type of thing at Christmas with their kids, but didn’t know how they would react. I say go for it! 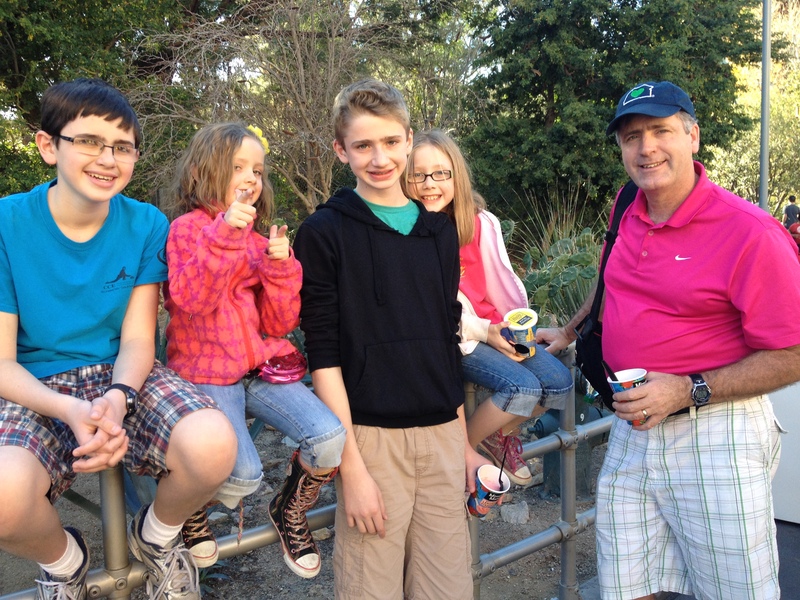 If you ask our kids, each of them will tell you that the time we spent together during the past two weeks – when every day was family time – was far more meaningful than the couple of hours spent opening gifts under the tree on Christmas morning. I think as parents, we get wrapped up in trying to make perfect Christmas memories, but spend more time wrapping, shopping, cleaning, and cooking, than we do just being with our kids. On a typical Christmas, I am usually too exhausted by the time it arrives to truly enjoy the small moments. Evan took me aside the other day and said, “You know, I think this has been the best Christmas ever”. I’m not saying we’re not looking forward to putting up our four trees and continuing our traditions again next year with our family and friends, but I think we will try to find a way to incorporate even one night away for the six of us into our Christmas vacation traditions from now on. For us, the focus of Christmas has never been on the gifts, but rather on hosting and celebrating our family and friends – we firmly embrace the “goodwill to all men” (and women and children) during the holidays. 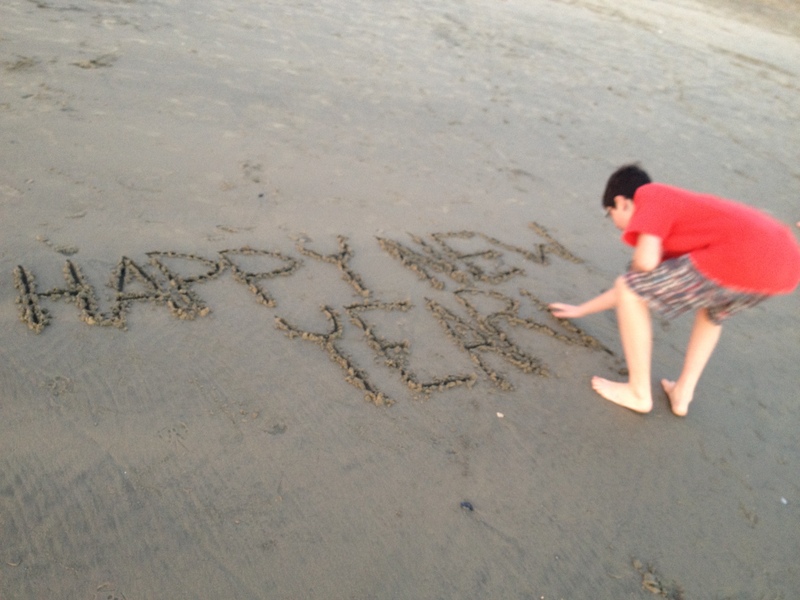 I resolve to focus less on the trappings, and more on the memories. We would like to thank Don & Cathy and family in New Hampshire, Kate & Willem and family in Salem, and Phil & Susan in Portland, for welcoming us into your homes this Christmas. Not only did you make us feel welcomed and wanted, but you also went out of your way, going above and beyond to feed Olivia and keep her safe. Having six extra people in your home and at your table can be overwhelming and we are so appreciative of your generosity. As we arrive home, we are bracing ourselves for the reality of real-life again. There are clothes to wash, groceries to buy, and bills to pay. Today, we pick up Alex’s exchange student from Brazil and one of the chaperones, who will be living with us for the next two weeks. D’Arcy & I need to prep for our new semesters, which begin tomorrow. (I have four new courses to teach.) The boys have an afternoon curling practice after two weeks off the ice to get ready for their first Canada Winter Games play-down which takes place in Shelburne next weekend! If I can make it there I’ll make it anywhere It’s up to you New York, New York New York, New York lyrics © EMI Music Publishing This post is intended to follow this one. In the girls’ room at the Marriott in Newark, I was the first to awaken, around 8:30am. I tried to peak out the window, which was frosted on the bottom 2/3’s (?! ), and saw that the snow had tapered to light flurries. I could only see the sky, so couldn’t see what the roads were like. I turned on the computer to check weather forecasts and road conditions. I also started pricing out rental cars vs. the train vs. a bus from New York to Boston. A rental van was by far the least expensive option, at around 150+ taxes and fees, bringing the total to just under $200. D’Arcy texted me to see if I was awake yet and came down to figure out what to do. Looking at the hourly forecast, it was showing that the flurries were supposed to be over by lunch, with sunny skies in the afternoon. We made the decision to stay at the hotel until noon checkout, and I booked us a rental van, to be picked up after lunch. 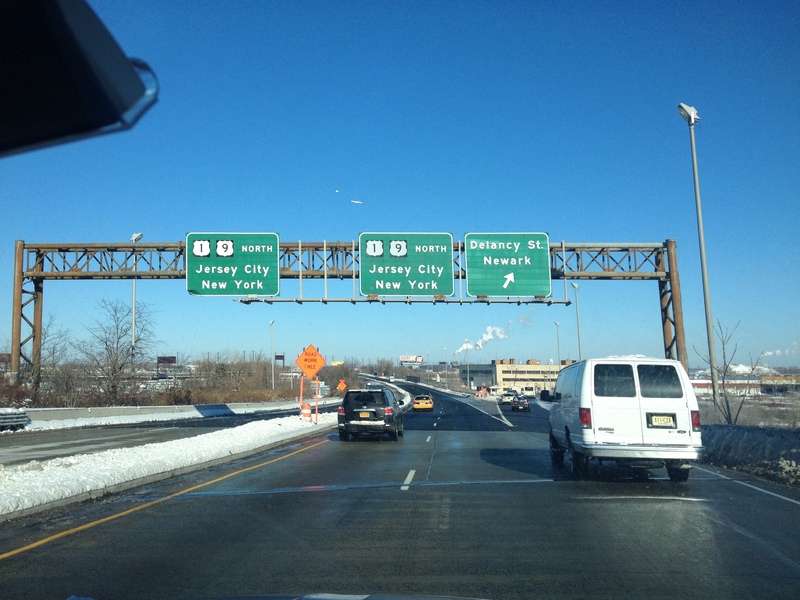 We would drive the four hours between Newark and Boston. Sarah slept in until a record 10:30, and Olivia woke at close to eleven. We turned on the New York news channel where they were applauding the efficiency of the new mayor and how efficiently he had ensured primary and secondary routes were cleared. They were asking people to stay at home if they had to, or to take mass transportation while the plows worked at getting the streets cleared. Also, they were warning people of the frigid temperatures. We checked out at noon and took the less-full-but-still-overcrowded hotel shuttle back to the airport where we switched to another shuttle to get to where the rental cars were. We heard a story from one couple who watched a robbery out their hotel window during the snow storm. They heard a bang and when they looked out their window, some guys had driven in to an electronics store and were calmly carting out televisions and putting them in their truck. We could see the damage and police presence as we drove past, and couldn’t help but wonder what we would have seen if we had ended up at having to stay at the Days Inn! When we got to the rental company, it took awhile for them to get the snow cleared off and the vehicle warmed up, and we were on our way. 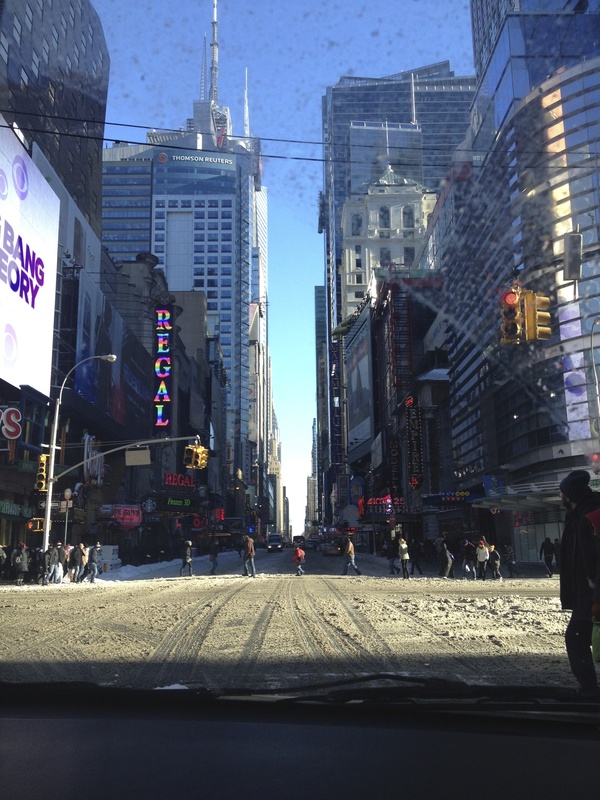 We assessed the roads, which were mostly bare and decided that since we were so close, we had to go into New York City. We stopped at McDonald’s for the first time of the entire vacation (It is a reliable “safe” food option for Olivia when we are on the road) so that the kids wouldn’t be hungry. We have Karen & Kevin’s GPS with us and it has been a lifesaver while driving in these strange cities in a rental car. 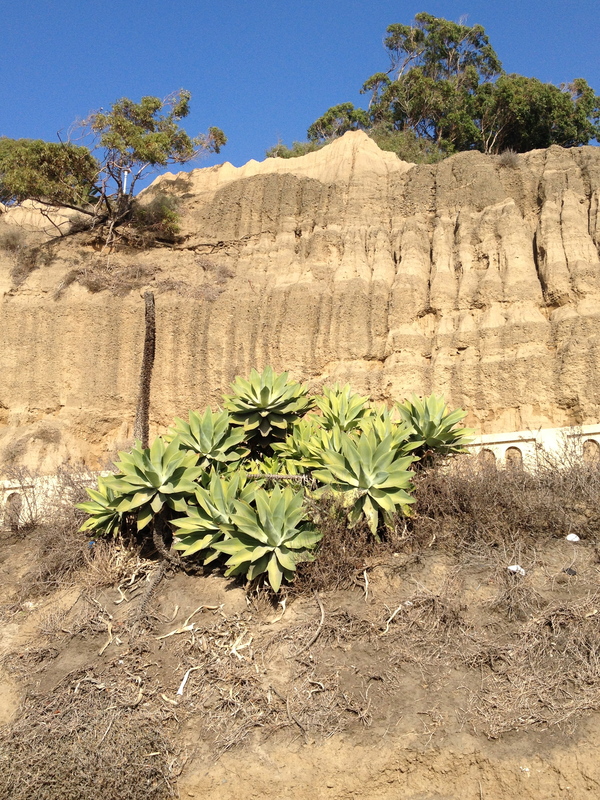 (With the exception of going up the Pacific Coast Highway to Malibu.) Because most New Yorker’s were at home braving the storm, there weren’t nearly the number of cars we would have had to contend with on a normal day. 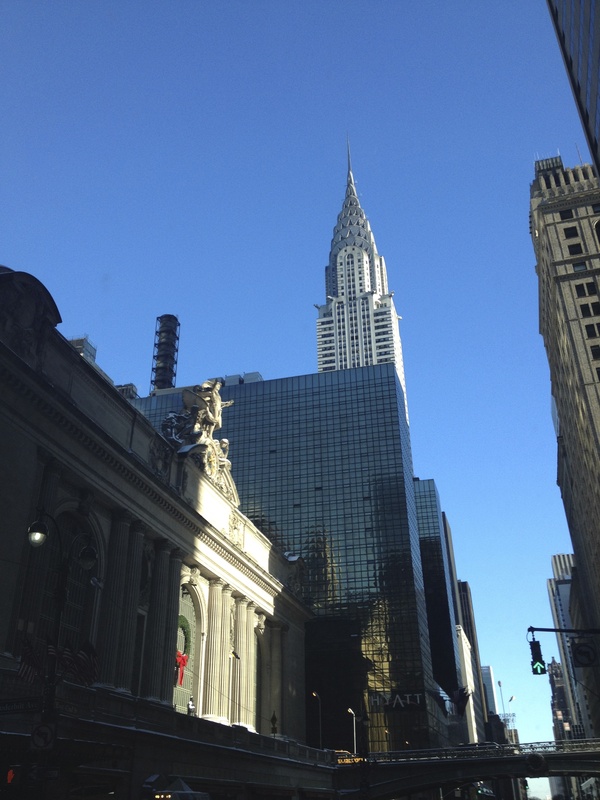 We drove right though Manhattan, past Times Square, The Empire State Building, and Grand Central Station. 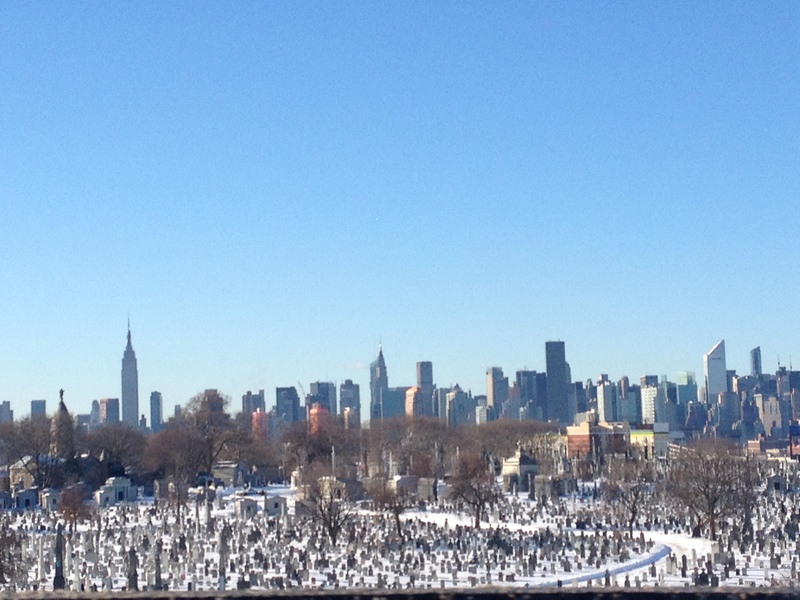 We saw Carlos’ Cake Shop, the Brooklyn Bridge, and drove through the Lower East Side. 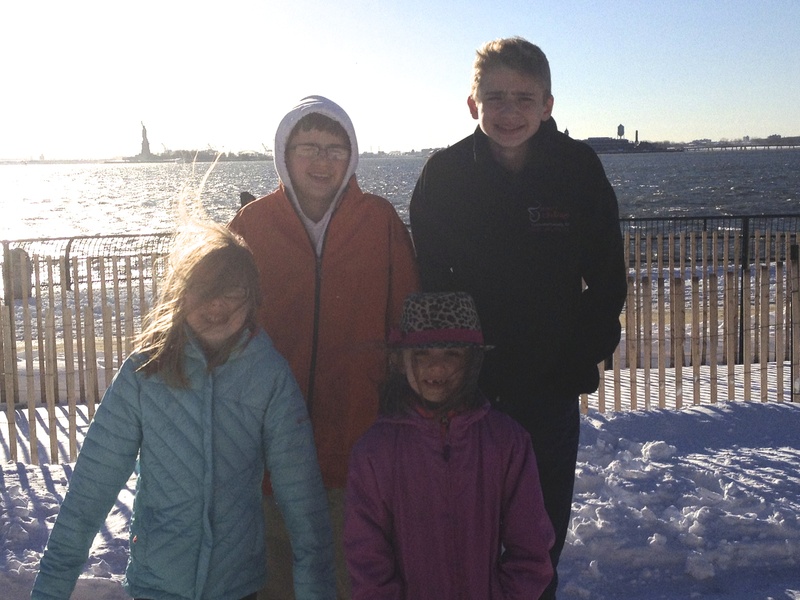 Since we were that close, we also had to drive to Battery Park to see the Statue of Liberty. Because there was too much snow to be able to park, D’Arcy let the kids & me out in the freezing cold to get a photo while he circled the block. Here we come, New York City! The Empire State Building, and Grand Central Station on the left. Shadows caused by tall buildings which also distorted GPS signal. 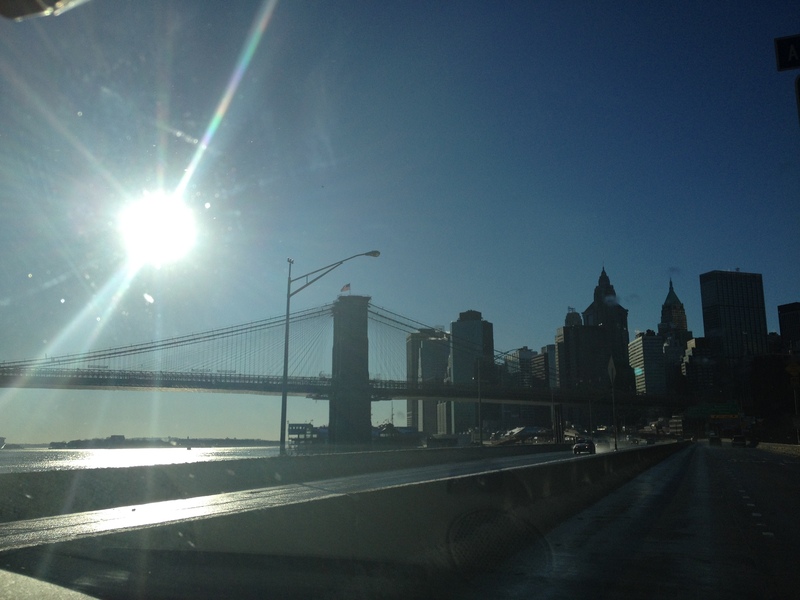 The Brooklyn Bridge in the Sunshine – no sign of the snowstorm the day before! The Statue of Liberty in the background. Kids were great sports to run through the snow in their sneakers and frigid temperatures. 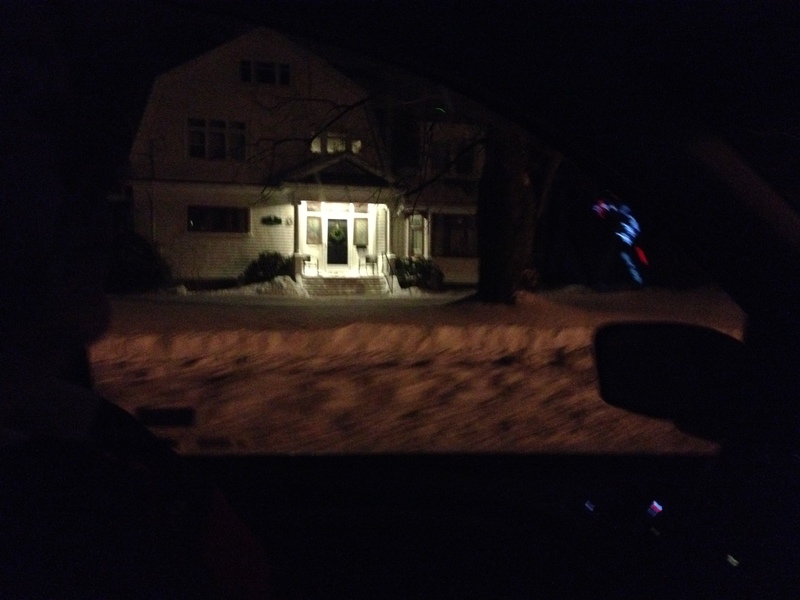 We were happy to get back into the warm car and drive the four hours through Connecticut on our way to Kate & Willem’s house in Boston. D’Arcy dropped us off and then drove to the airport to return the rental and pick up our own van from extended parking. Kate was working, having arranged to have been off work the day before when we were supposed to arrive. 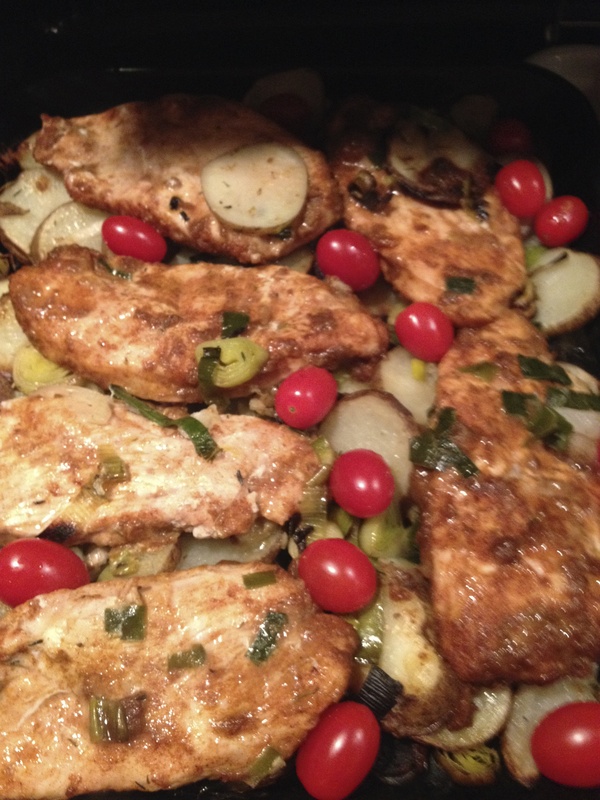 Willem made us the most delicious supper of roasted potatoes, leeks, tomatoes, and turkey breast. The kids were so excited to see one another again, so we hardly heard from them while we chatted. D’Arcy seemed to be taking a long time returning the van and getting back to the house. When I texted him, he was waiting for the shuttle to get from the rental company to the parking lot where our vehicle was waiting. A little while after that, I received another message that the battery in the van was dead and he was waiting for a boost from the attendant at the garage. It turned out that we’d left the dome lights on when we packed everything up two weeks ago. Although I felt sorry for him having to deal with that in the frigid temperatures, I was relieved that the children and I were not with him. That could have been the straw that broke the camel’s back as far as their willingness to go-with-the-flow. D’Arcy finally arrived at the house at close to 10:00 and had a plate of supper and a beer. Kate followed shortly afterward, exhausted after a twelve hour work day. She chatted for a few minutes and went to bed at the same time as the kids. Willam, D’Arcy, Evan, Alex, and I stayed up for a little while longer, chatting, before finally heading to bed. 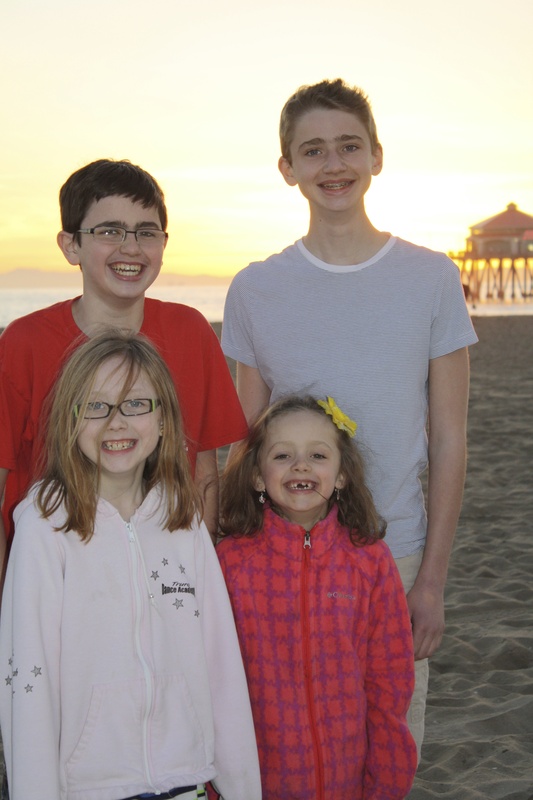 We were sad knowing that January 1 was our final full vacation day in California. 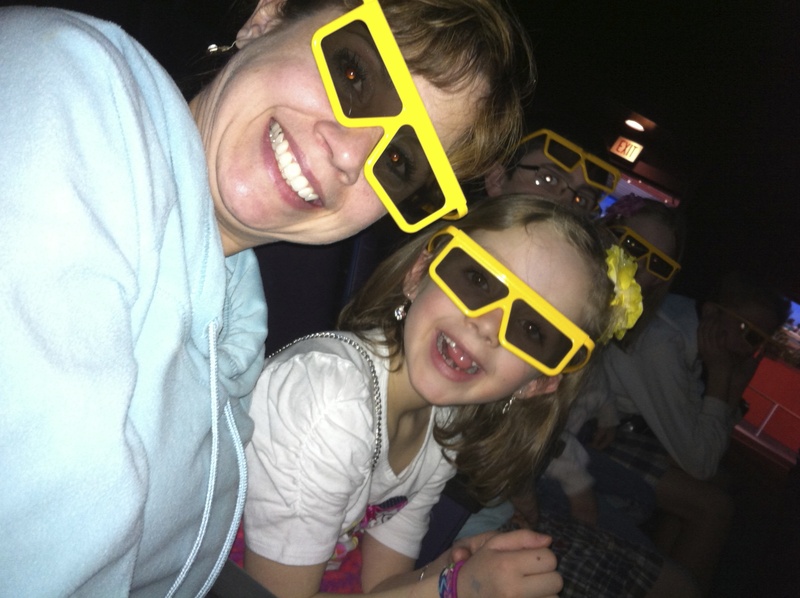 We needed far more time and money to see all the things we wanted to see! 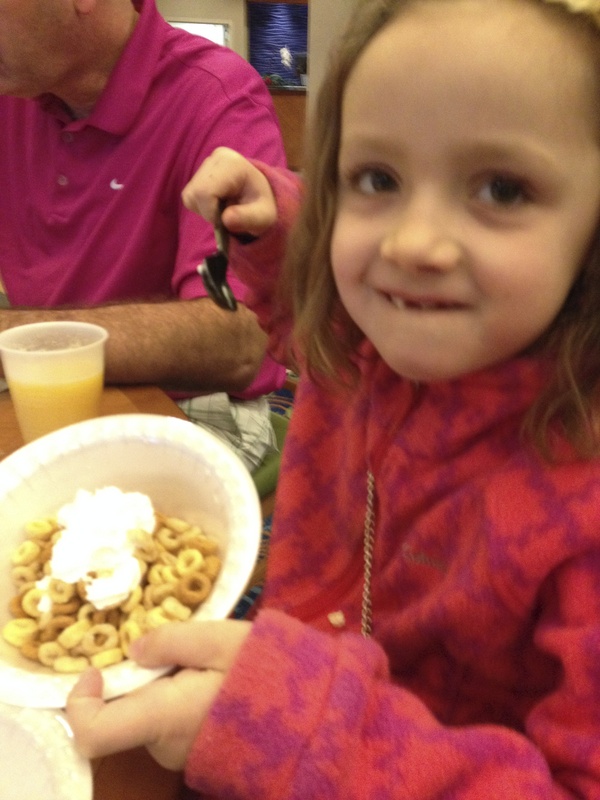 We had a final breakfast in the hotel, and went back to the room to clean up and pack up while watching the Rose Bowl Parade which was taking place in nearby Pasadena. I had looked into getting tickets (you can’t just watch from the street) but they were too expensive. We figured we could see it better on television anyway. We managed to check out of the hotel by 11am and started toward the coast. We have been traveling with a GPS, but she constantly was trying to take us the quickest route, and we were anxious to travel the scenic route. I had the map on my lap, but D’Arcy was driving and listening to “her” instead of me. 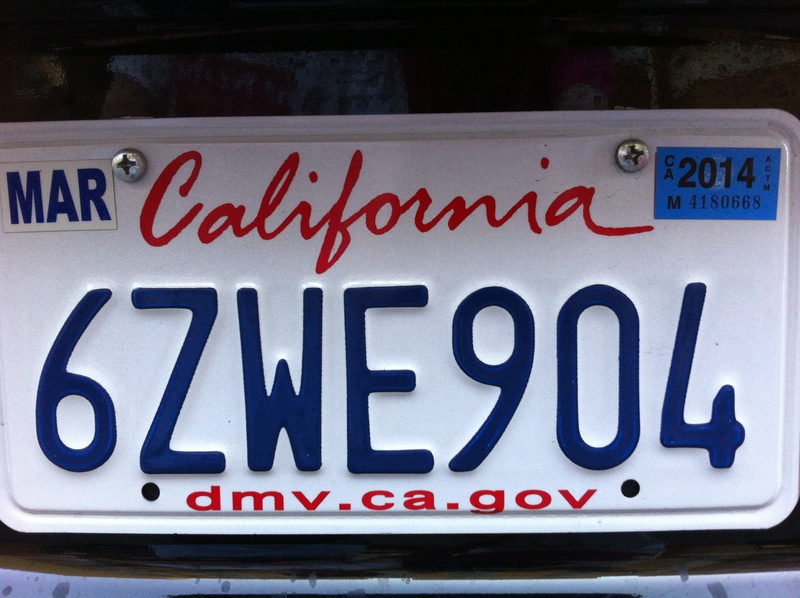 We drove in circles for a while until we got ourselves onto the Pacific Coast Highway, traveling North. We had to put poor “Suzanne” out of her misery and started listening to directions from “Richard” instead. 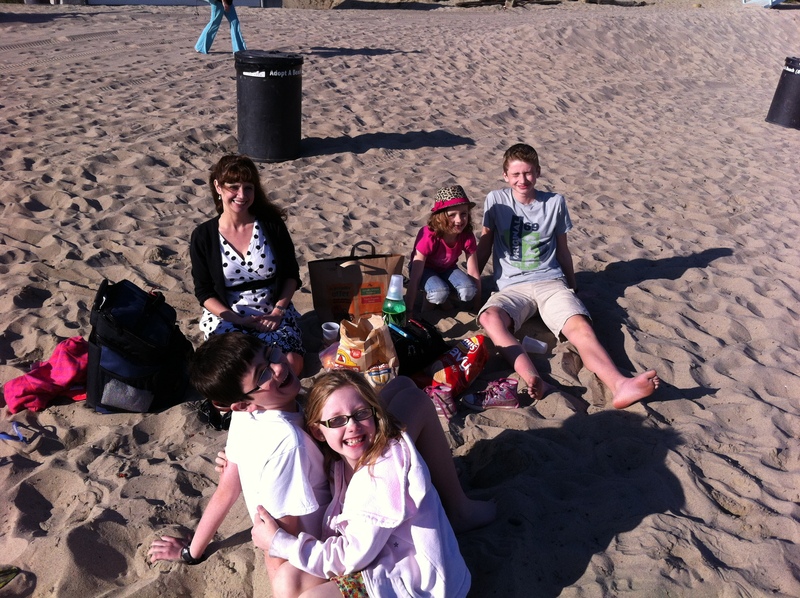 We traveled through Long Beach, Sunset Beach, and Seal Beach before driving through Santa Monica, and then stopping in Malibu for a picnic lunch on the beach. 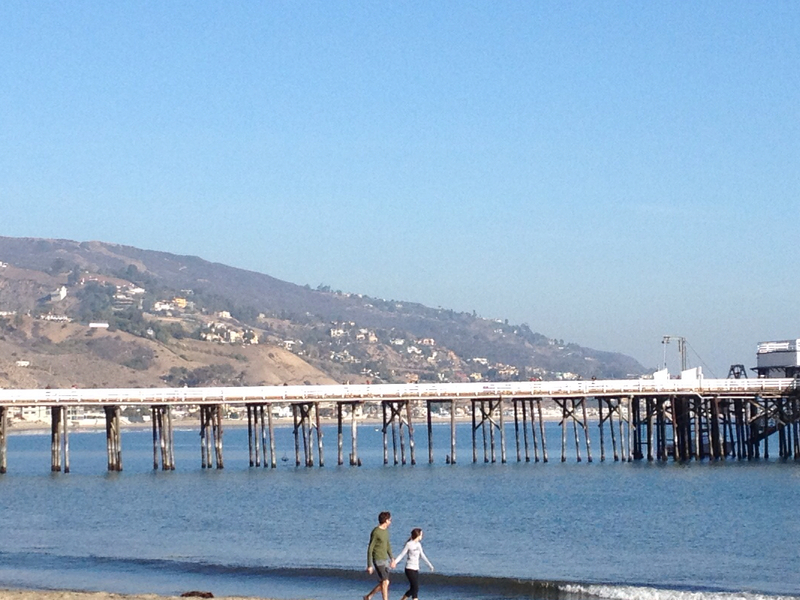 It was an interesting pit stop, and we all put our feet back into Pacific Ocean. Unfortunately, a teenaged girl who had arrived at the same time we did to go surfing was back out of the water almost as fast as she got in, after being stung by a sting ray. The beach lifeguards had to treat her, and then sent her off to the hospital. 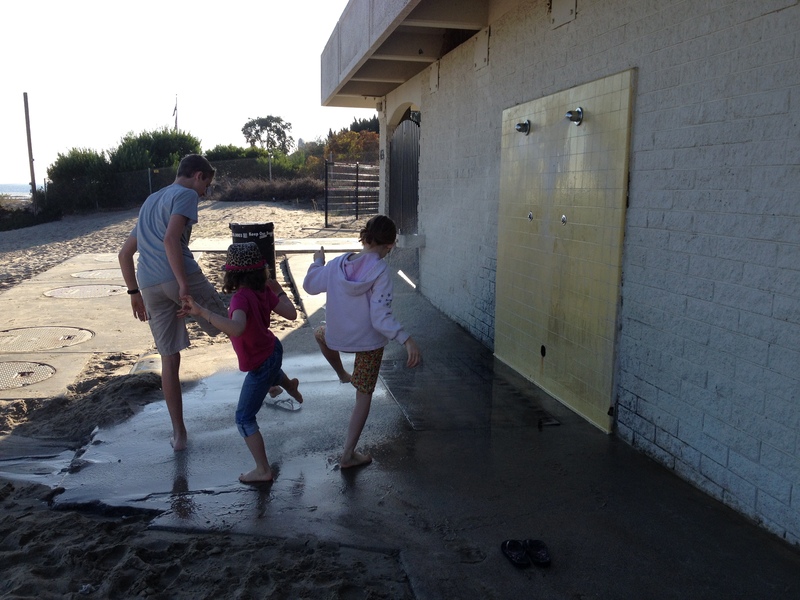 When it was time to leave, we went up to the washroom to clean the sand off our feet and legs. I jammed Olivia’s finger in the door of the bathroom stall by accident and felt awful about it! 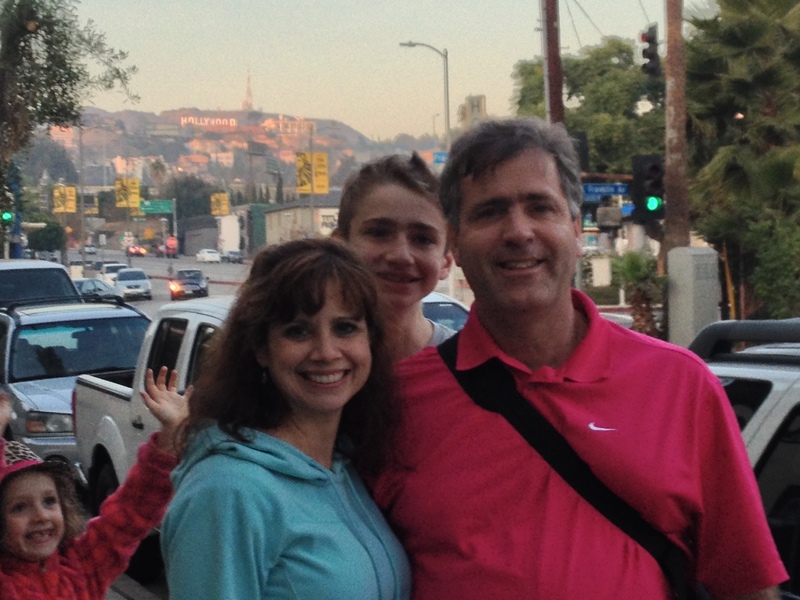 Up next, we were on our way to Hollywood and on a quest to find the famous sign! 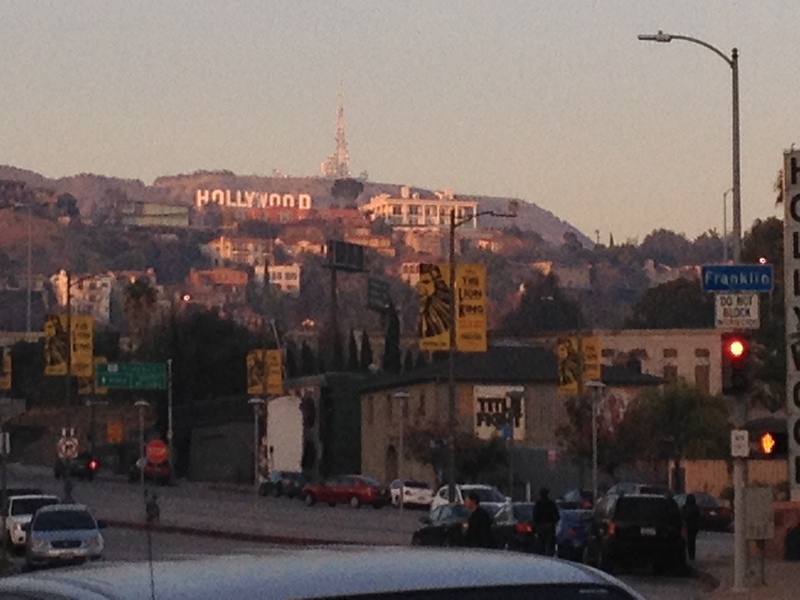 It turns out the sign is off in the hills and is well protected, so it’s tough to get an unobstructed view from Hollywood itself. 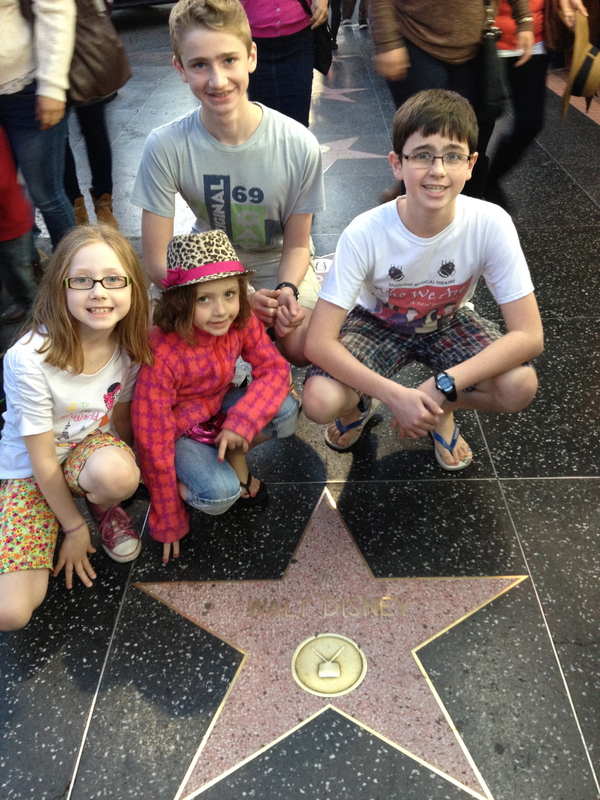 We walked along Hollywood Blvd., looking at the names along the Hollywood walk of Fame. We were surprised by how dirty and smelly the area was. 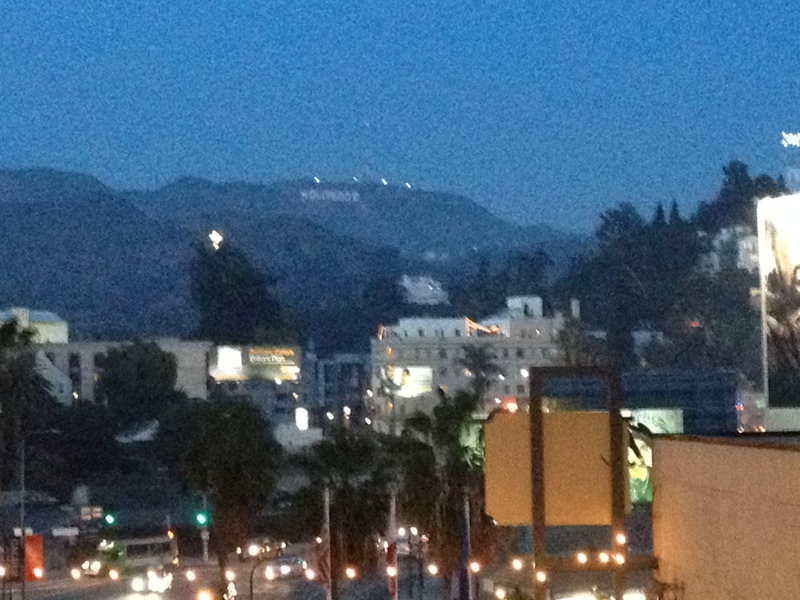 I guess when I think of Hollywood, I think of perfume and awards shows. They must clean the area up a LOT before those shows!! It was by far the dirtiest, smelliest place we encountered during our trip. As we walked the street, people were constantly trying to sell us things or take us on tours. The girls saw Mickey and Minnie and wanted to get there photo taken with them, so I reluctantly paid $1 to have them pose with the girls. Everybody’s got to make a living, I guess. 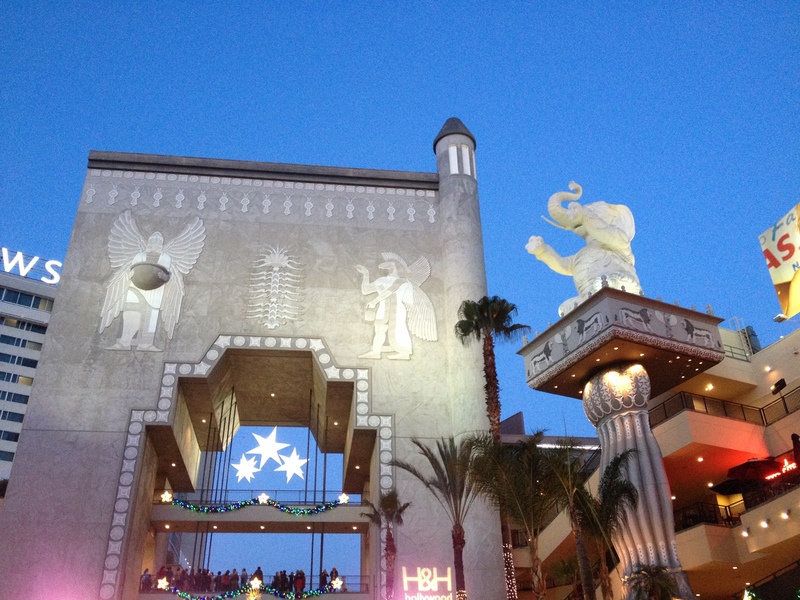 We walked far enough to see the Kodak Theatre where the Oscars are held, and also to the former Chinese Theatre. 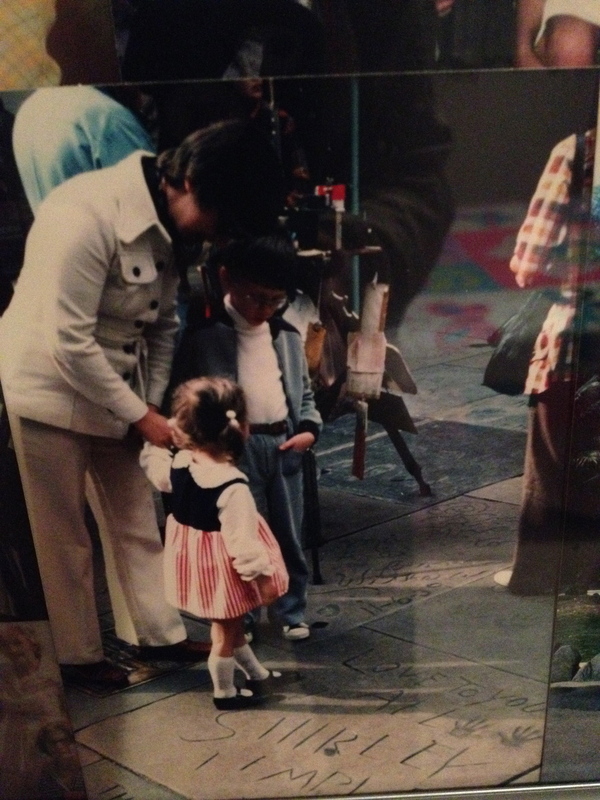 I had been in Hollywood with my parents when I was very young and had a photo taken with my handprints fitting exactly in those of Shirley Temple’s. I really wanted to find her handprints – and we did. My hands are larger now! 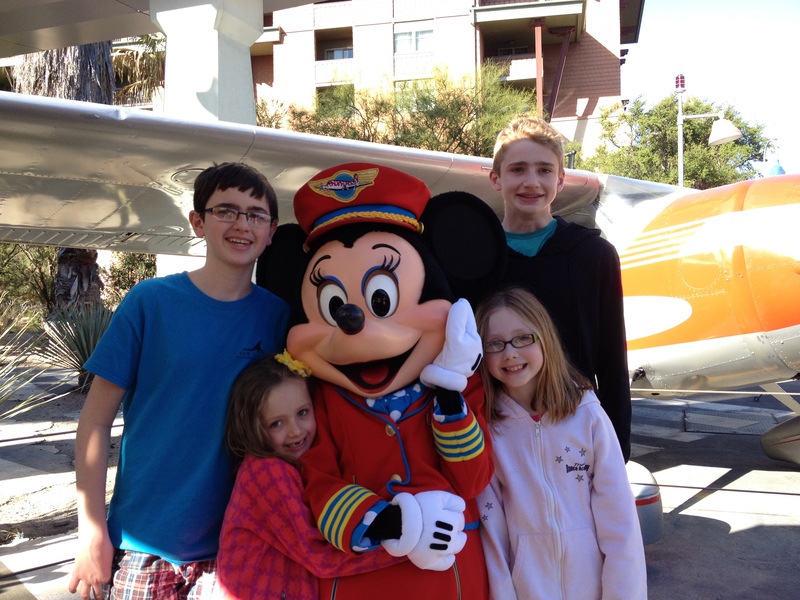 Finally getting their photo with Mickey – although we had to pay $1 for this one! We were glad we had made the effort to be there, but were happy to leave the area, and decided to get closer to the airport to eat. 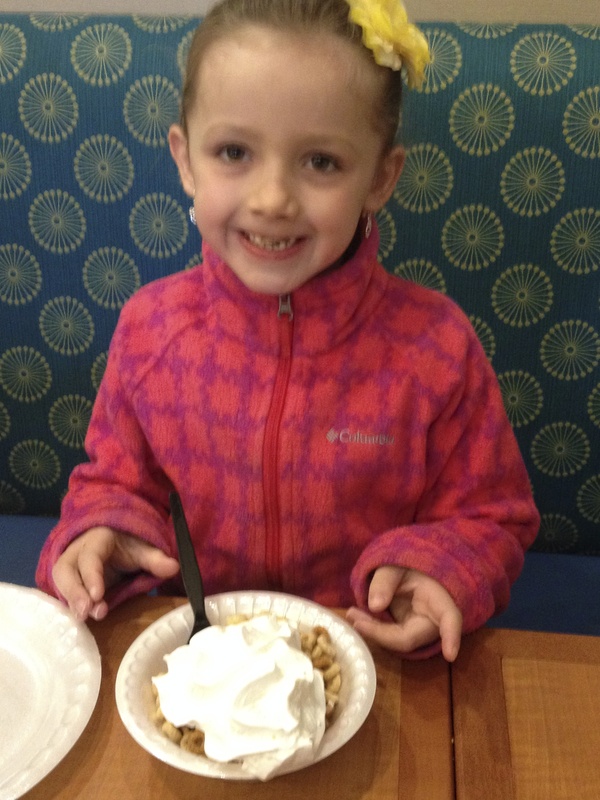 We found an outdoor shopping mall that was filled with little restaurants and found one online that appeared as though it would be good and we’d be able to find something safe for Olivia. Whether I was half asleep, or tired, I’m not sure, but I somehow turned “Island Burger” (where I wanted to go) into “Rave Burger” (located upstairs in the movie theatre). It was just a small place, and looked more like a hotel bar than what I had anticipated, but our server was very friendly and apologized for the fact they were under some renovations so had no beer on tap and no burgers because they were frozen. We’re still giggling about the fact Rave Burger was out of burgers… The kids all had root beer floats and the server was extremely cautious about Olivia’s allergies; even taking a photo of the packaging and showing it to me at the table. Olivia and I split nachos and a salad, D’Arcy had a chicken sandwich, Sarah had fries, Alex had wings, and Evan had a pizza. 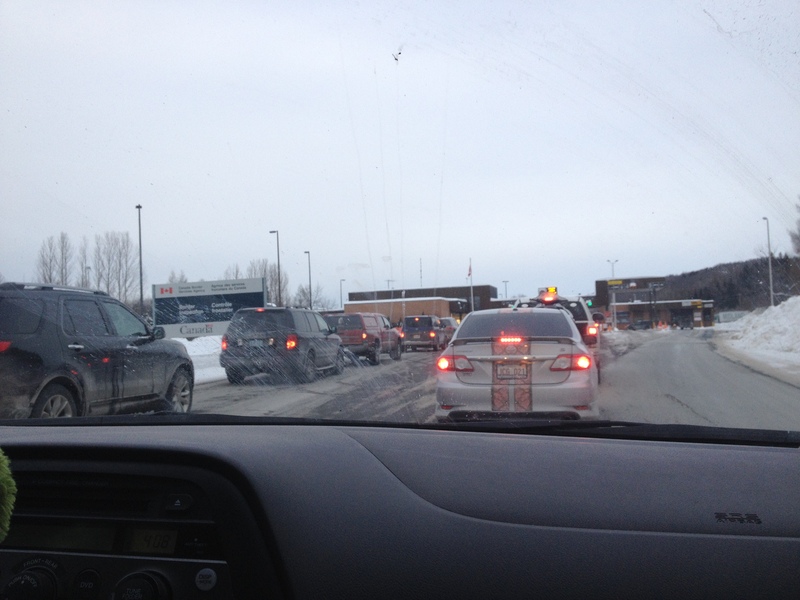 Before we knew it, it was time to return the vehicle and go through security at the airport. We knew that there was a storm coming and were hoping that we’d be able to get home ahead of it. On the final day of 2013, we had no need to wake early; our Disney days were over and we were on our own timeline. We slept until eight and went downstairs to eat, learning that the restaurant is much busier later in the morning. I was surprised. It was full of families, and I saw some families putting food (like full apples, oranges, and bananas) into Ziploc bags and taking it with them after they ate. Being in the hospitality industry, that drives me a little bit – okay, a lot – crazy! We made the decision that it would be less expensive and much more convenient for us to rent a vehicle for our last two days in California. Our flight on the 2nd was scheduled to leave after midnight, and we’d have to check out and deal with our things at 11am that morning. 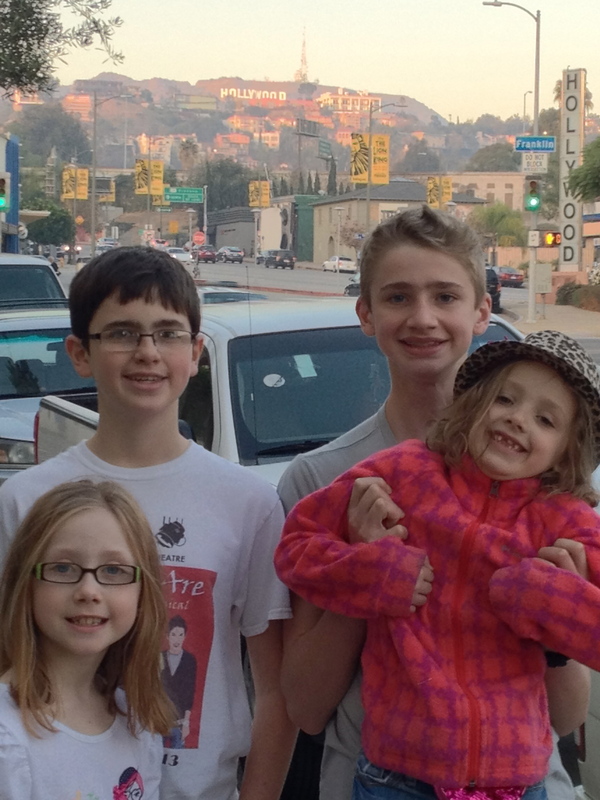 We knew we wanted to tour Hollywood and go to the coast, so it seemed logical. 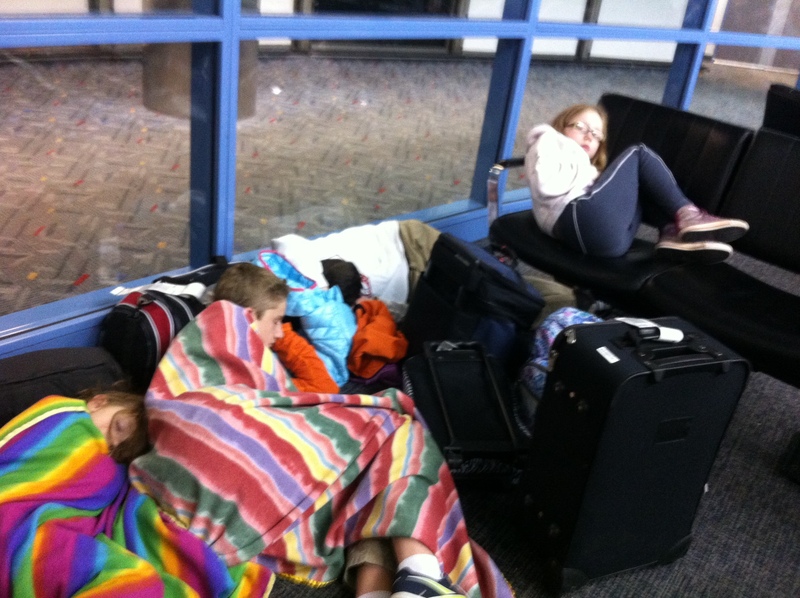 We made some calls, and found we could rent a van, but we would have to pick it up and drop it off at the airport. 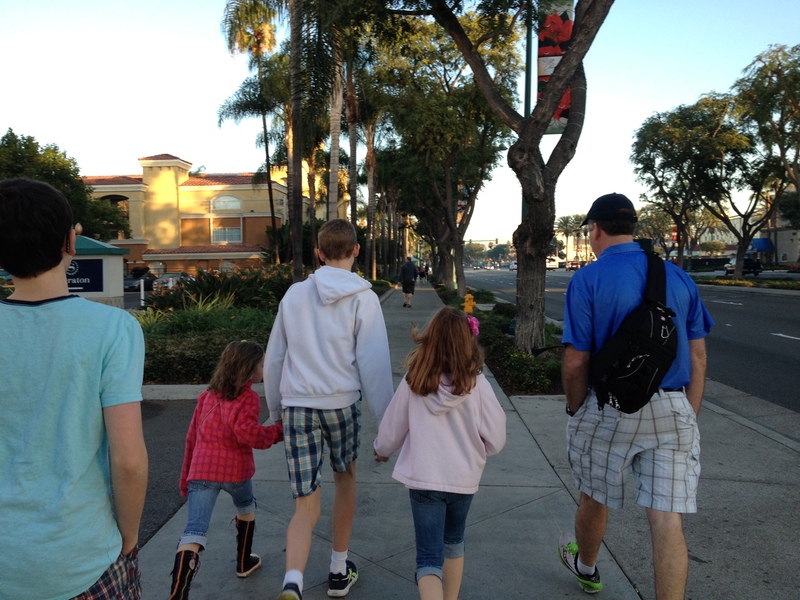 The kids had their own money still to spend, so we decided I would take them to Downtown Disney while D’Arcy to a shuttle to LAX to pick up a vehicle; we would meet up again in the afternoon. Santa had brought Sarah & Olivia some Disney themed fake fingernails, so Olivia put those on and we set out walking the 3.5km to Downtown Disney. The kids were in great spirits and the girls were cartwheeling on the sidewalks. 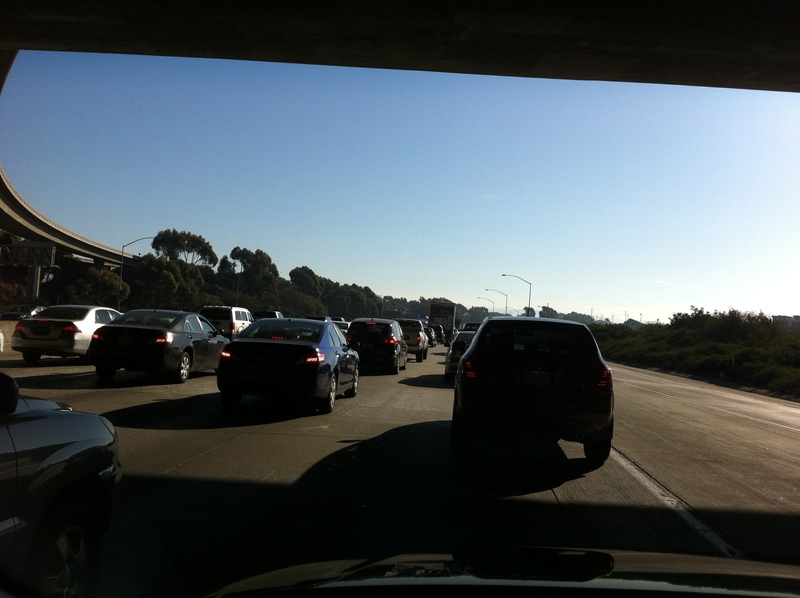 We had a text from D’Arcy saying the traffic was a bit nuts and the shuttle he was on was playing “Finding Nemo”. 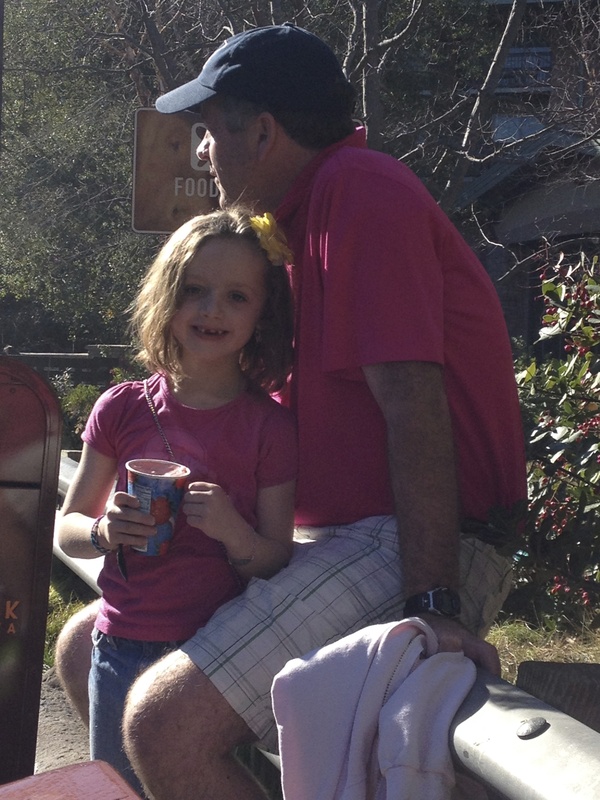 On our way to Downtown Disney – Olivia showing off her beautiful fingernails! 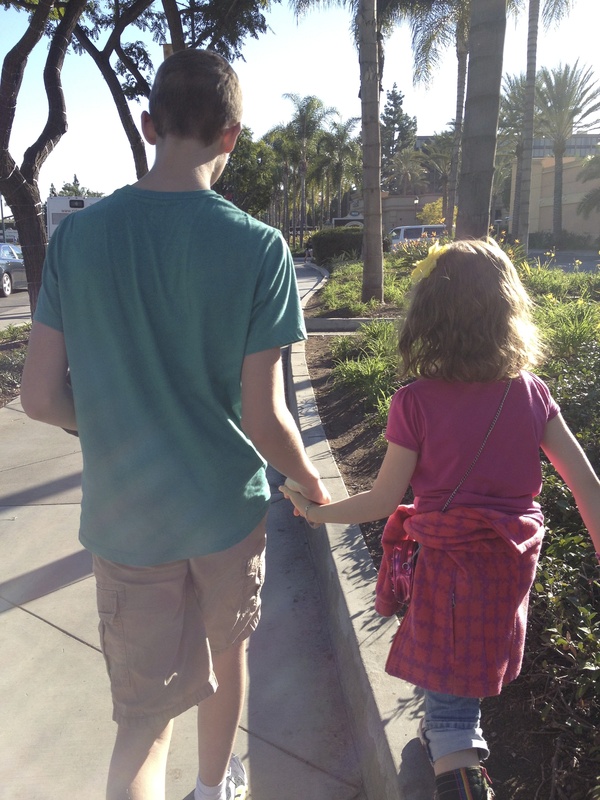 At Downtown Disney, we went in to the World of Disney store. Each had their own money to choose to spend as they wished. I stayed with the girls, and we set up a meeting time and place with Evan & Alex before separating to shop. 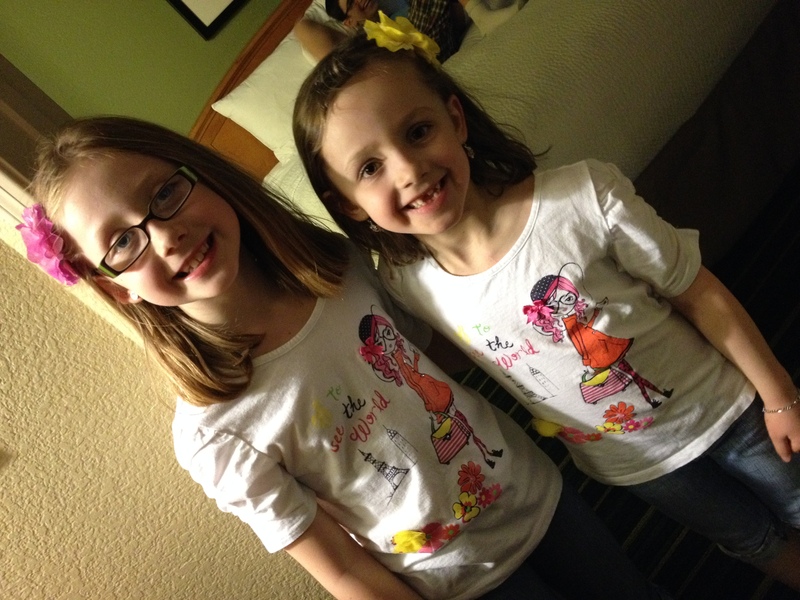 Sarah & Olivia each wanted to get something for their cousin, Neil. 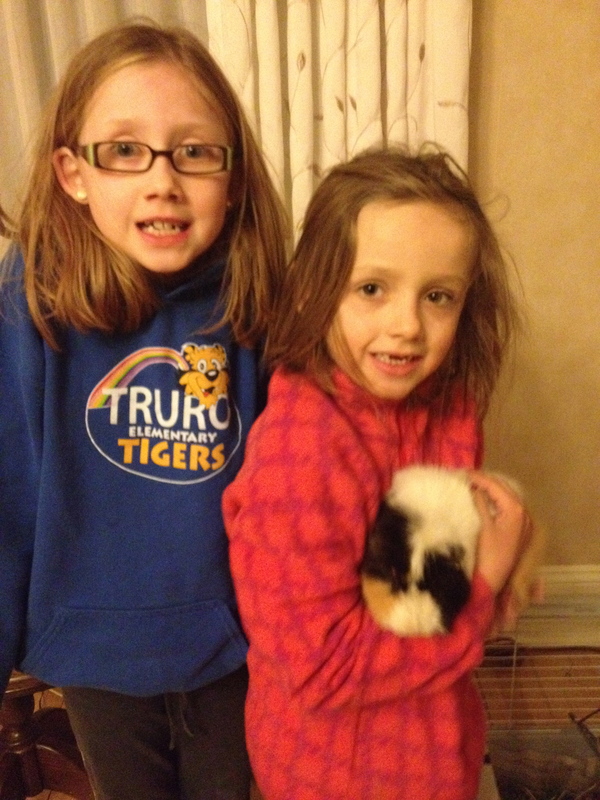 Neil has been looking after Olivia’s guinea pig, Caroline, while she was away, and is in Sarah’s class at school so they are very close. They looked around the whole store, making note of what things he might like. They are very thoughtful shoppers. After an hour in the store, Olivia chose to buy Neil a glow-in-the-dark set of cards, and an Ariel wig for herself to go with the costume Santa brought her. Sarah chose to buy Neil a keychain that she could put his name on, and a three person locket “Best” “Friends” “Forever” for herself, and her friends Chloe & Lily. Evan bought himself the basic Disneyland mouse ear hat, and Alex didn’t find anything he felt was worth spending his money on. There were a couple things he had his eye on, but figured if he bought them he would have buyer’s remorse. I bought one thing – a Mickey Mouse Christmas tree ornament to hang on our tree next year; our vacation tradition. Olivia kept dropping plastic press-on nails and handing them to me to look after. As we started walking back home towards our hotel, D’Arcy sent me a message saying that he was close and to keep an eye out for him. We had only walked about a block when we heard him beep at us, and we crossed the street to hop in to the SUV. At the hotel, I heated up the leftovers from the night before, made small salads, and put out some apples and carrots so we could have a late lunch/early supper before heading to the Pacific Ocean! If there’s anything I’ve learned about traveling with kids, it’s that there is little complaining if their bellies are full! 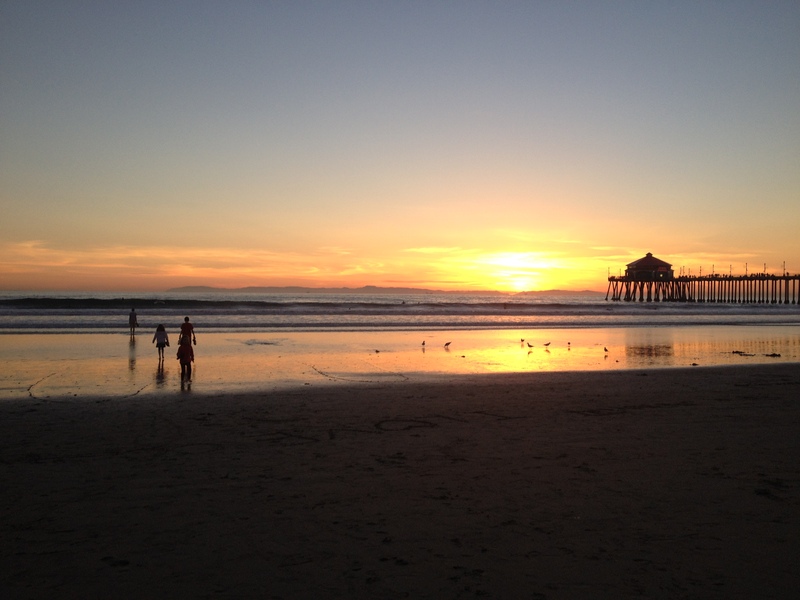 At the recommendation of the guest service agent at the front desk of the hotel, we went to Huntington Beach, located about a 45 minute drive from our hotel. It was beautiful and expansive and we arrived just before the sun was setting. 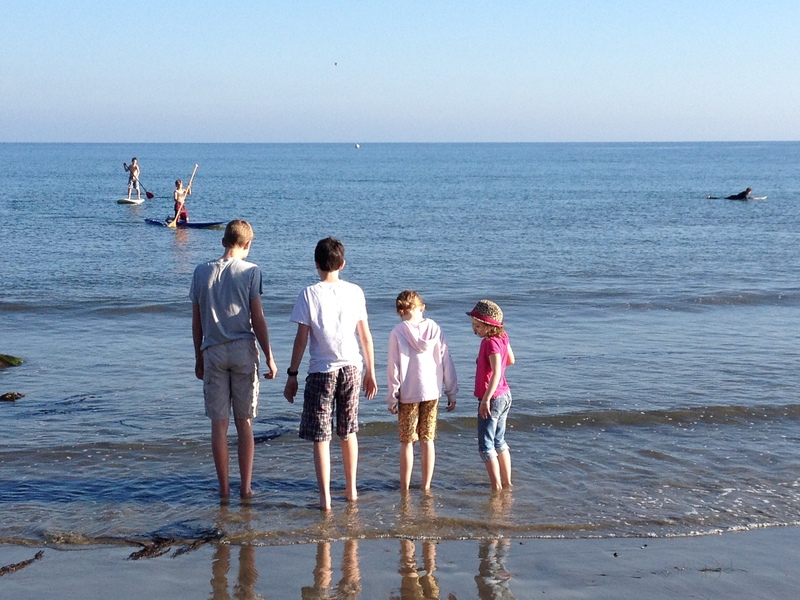 The six of us all got our feet in the ocean and played in the soft, cold sand. After the sun went down, we walked up to the end of the pier and back. On the pier, we saw a family catch and release a baby sting ray. What a way to send off the old year! 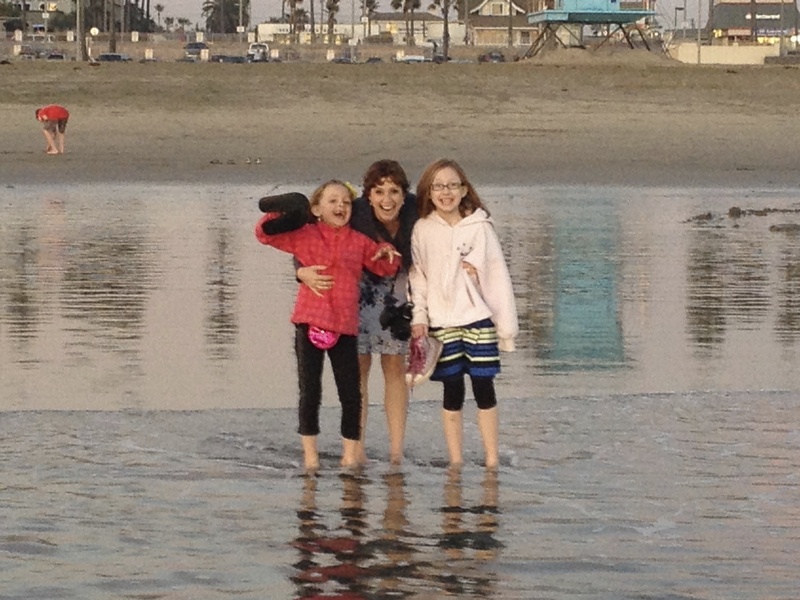 The Pacific Ocean is cold! Happy New Year from the McDonah kids! On our way back to the hotel, we stopped at the grocery store for some food and champagne, thinking everything would be closed the following day the way it is in Nova Scotia. We bought a bottle of Californian Barefoot Sparkling Wine for $6.95 as we have a tradition that whoever stays awake until midnight gets to take part in a champagne toast. (Just sips for the kids.) We discovered limited edition pumpkin cream cheese so bought some, as well as more nibblies for the evening. Our plan was to go back to the hotel and play games until midnight. 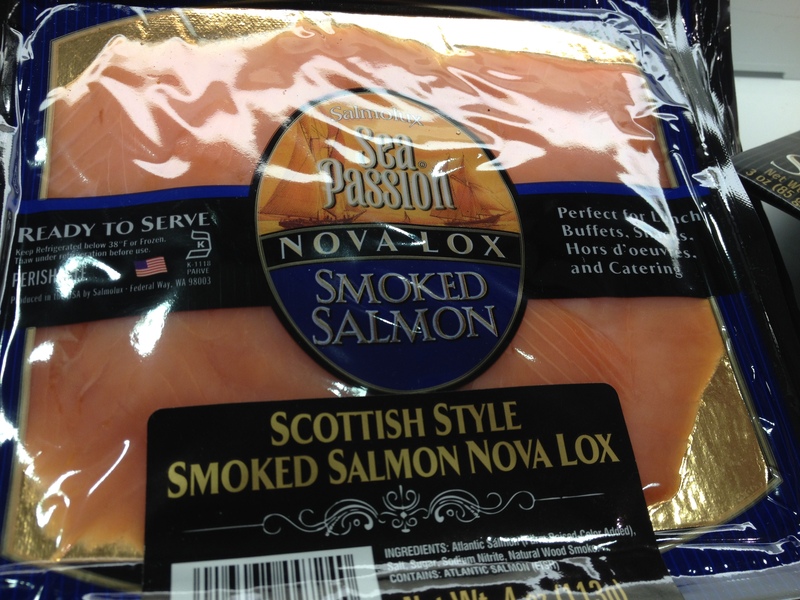 Look what we found in the grocery store! When we got to the hotel, it was almost midnight at home, four hours ahead. 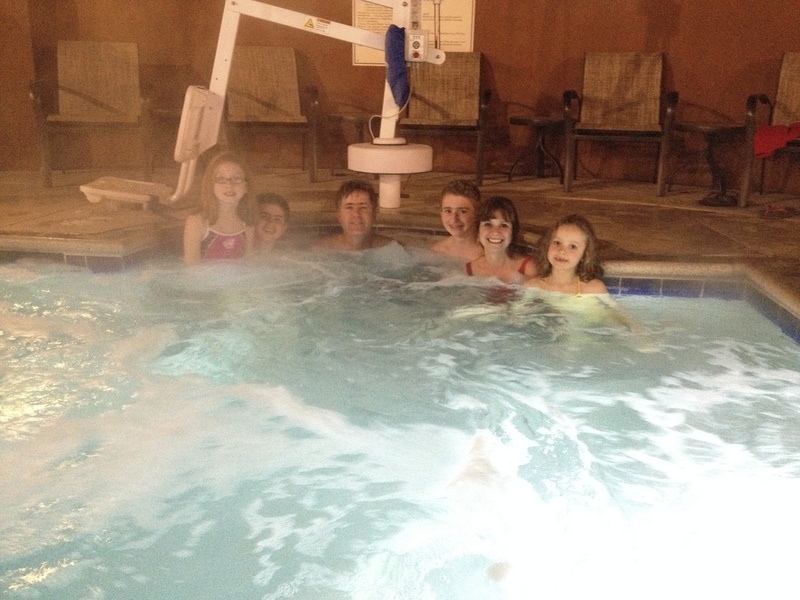 We counted down to the AST New Year, sent some greetings on Facebook, and then the six of us went to the hot tub. We had intended to be back in our room to watch the ball drop in Times Square, but were having too much fun at the pool, and it was long over when we got back up stairs. On our way in, the front desk gave the girls hats and noise makers, and D’Arcy a complimentary bottle of sparkling cider. The kids started making toast with the pumpkin cream cheese and we never did get the other food out. Olivia fell asleep on the pull-out couch with her food on a plate in her lap. 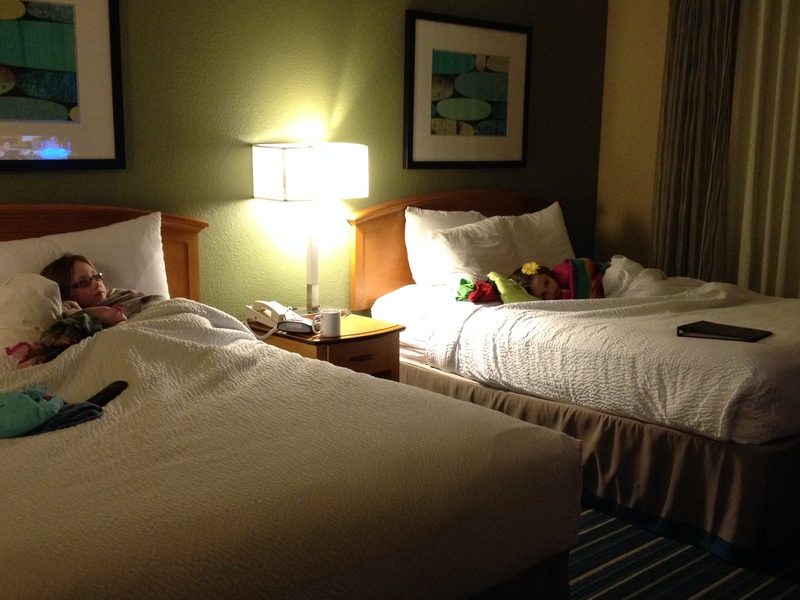 By 10pm, all of us with the exception of Alex had dozed off where we were! I woke up in time for anti-climactic countdown on Pacific Coast – all they do is replay the NYC segment! I was expecting that there would be a Pacific Coast celebration of their own. It’s tough to stay awake until midnight! D’Arcy & I each had a sip of sparkling wine, but the boys didn’t want any and the girls were still sleeping. We went to bed thankful for our many blessings this past year, and looking forward to the year ahead of us. Although we had fun at the Magic Kingdom, we preferred California Adventure Park, probably for a number of reasons: the crowds seemed to be disbursed more evenly, there were fewer strollers to navigate, the rides were more exciting, we were rested and more organized. We made the 3.5 km walk to the park and picked up our tickets for the day just as the park opened at 8am. We had a plan and immediately went to the California Screamin’ roller coaster – an upside-down-loopty-loop high-speed adventure. We grabbed a fast pass and rode the coaster immediately. What fun! The line was still short so we got back in and went immediately after. 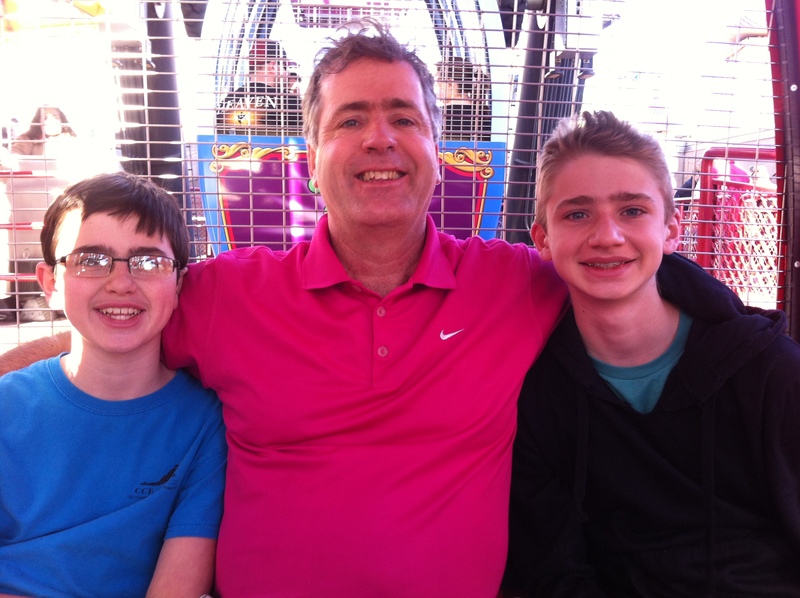 We went from there to Mickey’s Ferris Wheel, which raised us 150 feet in the air. We had a choice of a swinging car or a stable car and I chose the stable car, much to the others’ disappointment. I think they were relieved after we got up there though – what a view!! 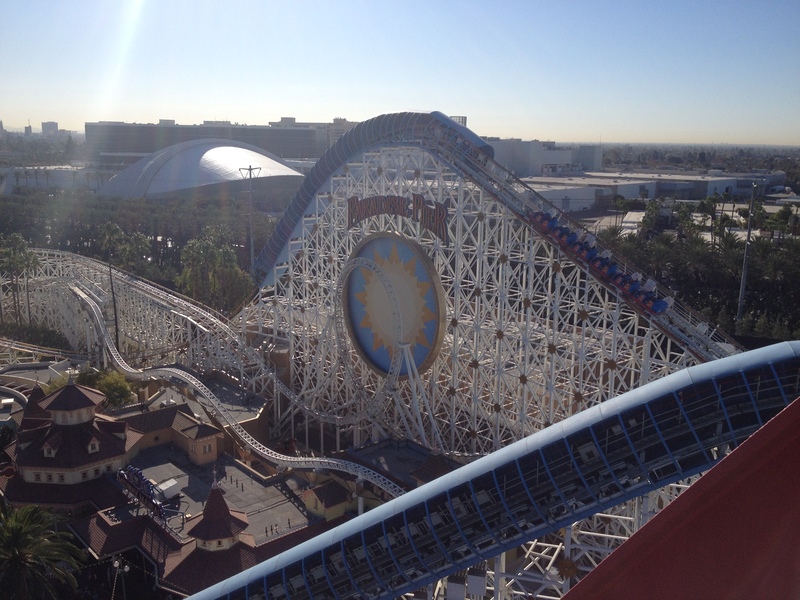 California Screamin’ roller coaster – we rode it three times! 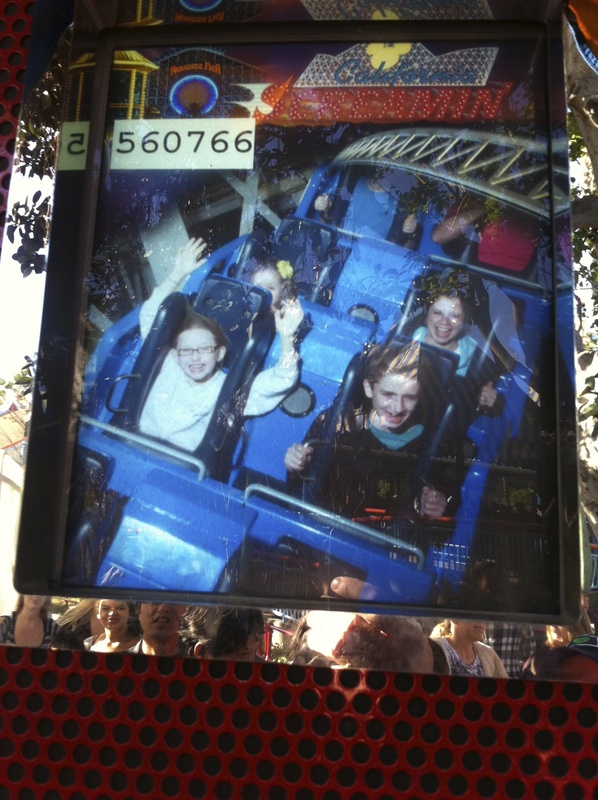 Sarah freaked her mother & sister out, keeping her hands in the air the whole time. 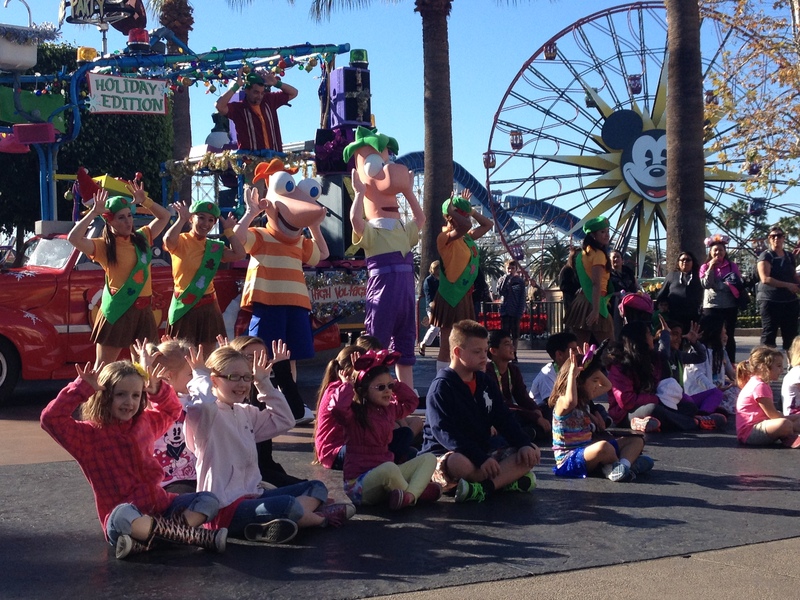 As we wandered back to meet up, the girls and I stopped to see a Phinneus & Ferb live street show and got picked to go up and dance. They had a blast! We met up at the Grizzly Rapids, where we were able to secure a fast pass for the evening’s 10pm “World of Color Winter Magic” show before riding the rapids. D’Arcy and the boys got soaked while the girls & I fared slightly better. Alex had been wanting to try a Churro (fried pastry with cinnamon sugar) since Evan had raved about the ones he had in Brazil. He bought a couple to share (eggs, so not safe for Olivia) and they ate them in the sun while drying off. 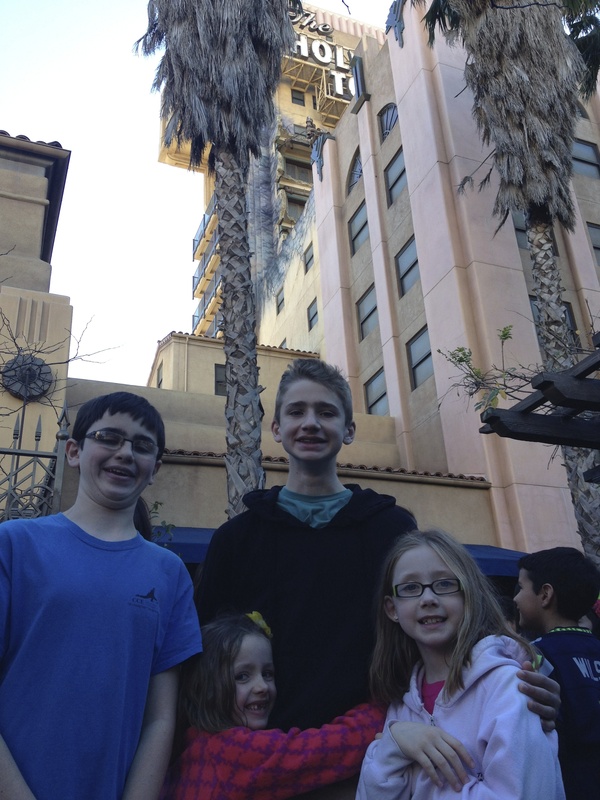 While we were that close, we went over to secure a fast pass for the “Soaring over California” ride, then went to the other side of the park to ride the Tower of Terror, narrowly avoiding being run over by a trolly. My recurring nightmares are of being in a free-falling elevator, so this ride is not my idea of a good time. However, the boys love it and the girls were keen to give it a try. We waited in a line of about 35 minutes with some interesting people and chatted, making the time pass more quickly. The girls were all smiles at the beginning of the experience. 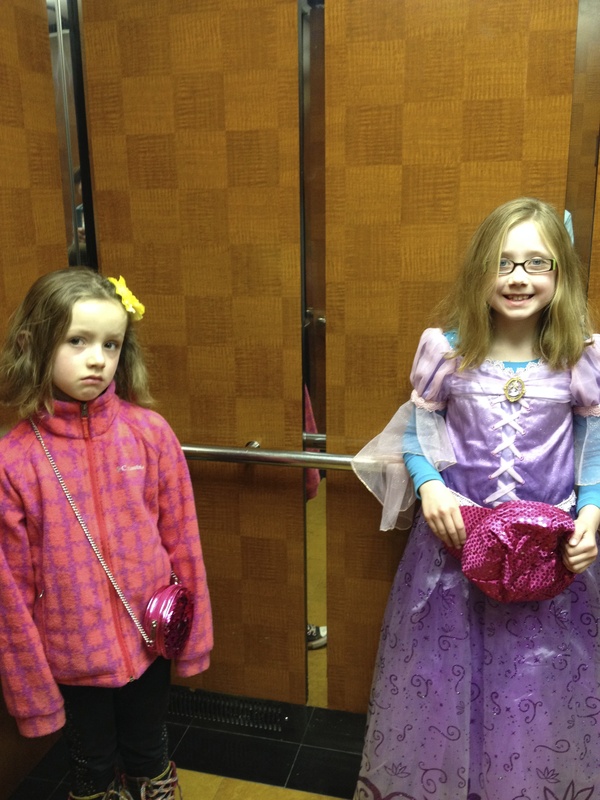 Once they got buckled into the elevator itself, however, it was a different story… Sarah was really and truly terrified by the experience and vowed never to ride that one again! 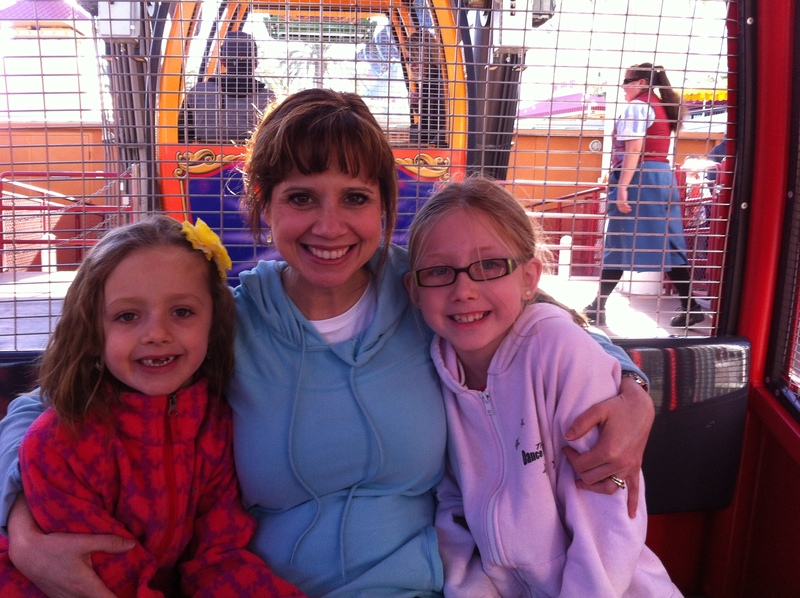 Sarah & Olivia are frozen in their seats – just before the first drop! Hot and tired, we stopped and got some frozen lemonade and took our time eating them while wandering around. We stood in line to get a photo with flight attendant Minnie Mouse before heading into the Soaring over California adventure. It was one of my favourite experiences at Disney. You’re strapped in to a glider seat and lifted high in the air as you are guided through a 4D experience simulating the California landscape. As you glide over the citrus groves, you can smell the citrus, and you get the impression of a golf ball whizzing past your head as you fly over Palm Springs. We left the park after that ride and went back to the hotel for a break. D’Arcy and I were going to walk to the grocery store together and leave the kids in the room with the boys in charge, but as we were leaving, housekeeping was coming to make up the room, so we took the kids with us. 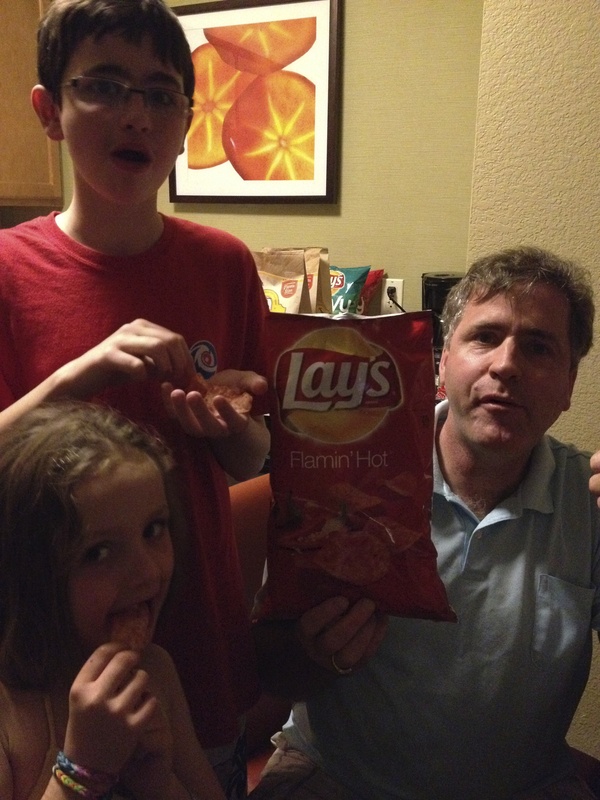 At the store, we got supplies to make supper, Back at the hotel, Evan rested while I made supper and D’Arcy took the other three kids to the pool. Back in the room, Olivia crashed while we had lasagna, Caesar salad, and garlic bread. 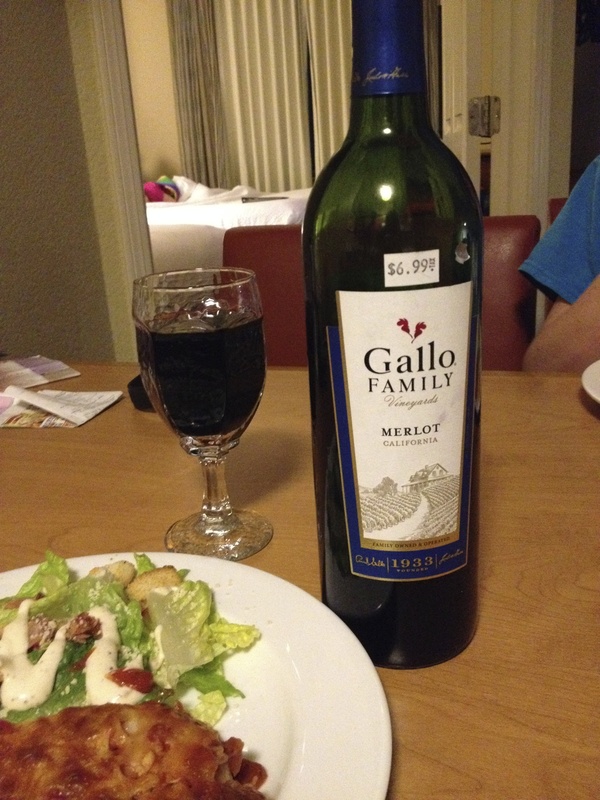 Mom & Dad shared a $6.99 bottle of California wine. After supper, Sarah napped briefly too and D’Arcy went down to the lobby to buy shuttle tickets ($24) to take us back to the park for the evening. The hotel under construction near ours that Alex thought would be a good extension to the Belgravia! The public bus was an eye opening experience, to say the least, with some very colourful characters on board. One woman wearing a hula skirt said she recognized us from an intersection we had crossed a number of times, so she probably did. Then she told us some crazy stories while another passenger further back on the bus was laughing at her, saying she was crazy. I was quite happy to get off at the park. 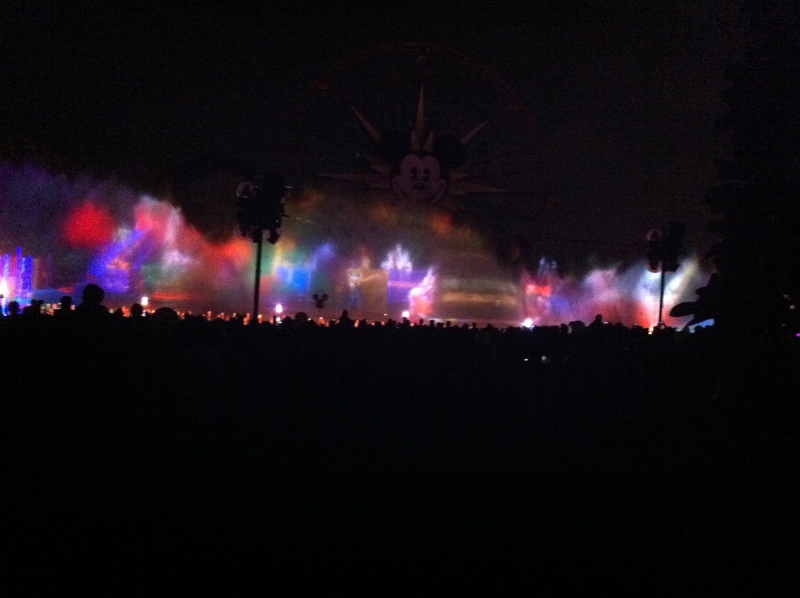 The World of Colour show, which takes place in Paradise Pier is a half-hour water, sound, and light show and was worth going back to the park for! Some of the fountains shot up over 200 feet in the air, higher than the Ferris wheel we’d been on earlier in the day. With our fast passes, we had a decent viewing spot, with no one directly in front of us to block our view. However, we were far enough away that we didn’t get wet. When the show was over, the park was closing and we had a problem trying to find where to catch our shuttle. We were given two different directions, then finally found it at the outside gates, just in the nick of time. We said good night and good bye to Disney, anxious to get into bed. 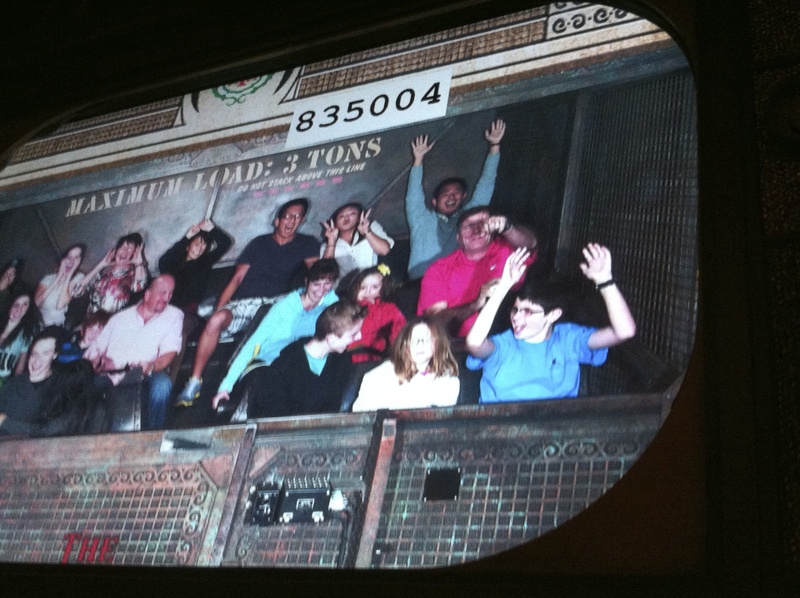 Sarah was worried she’d have nightmares from the Tower of Terror, but I reminded her to think about all the fun and positive things she’d done in the past two days as she went to sleep. Our first day at the “happiest place on earth” dawned bright and early. 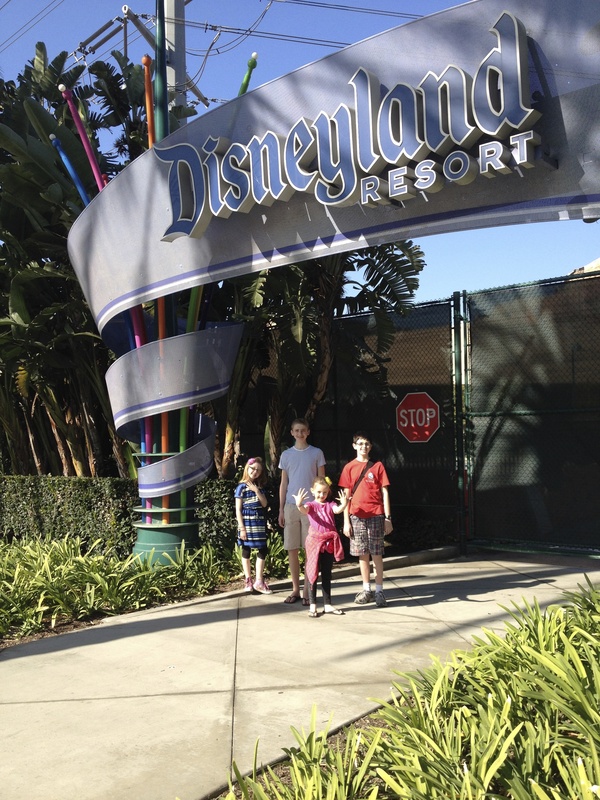 D’Arcy & the boys had gone to the Disney Welcome Centre the night before to check about our tickets. 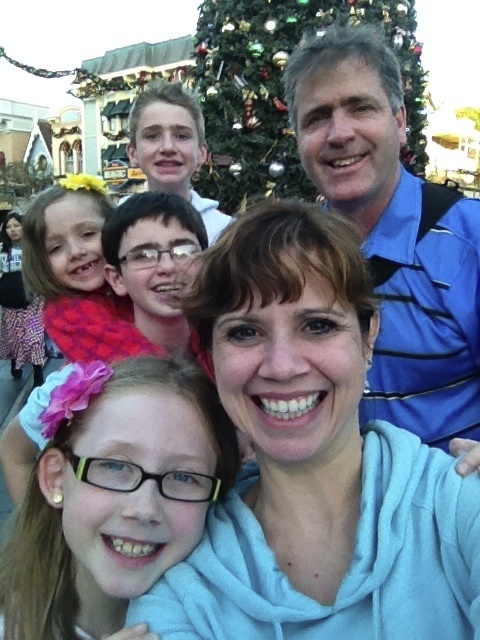 Six years ago, when we took the boys to Disney World, we had bought six days worth of no-expiry tickets, but used only four. 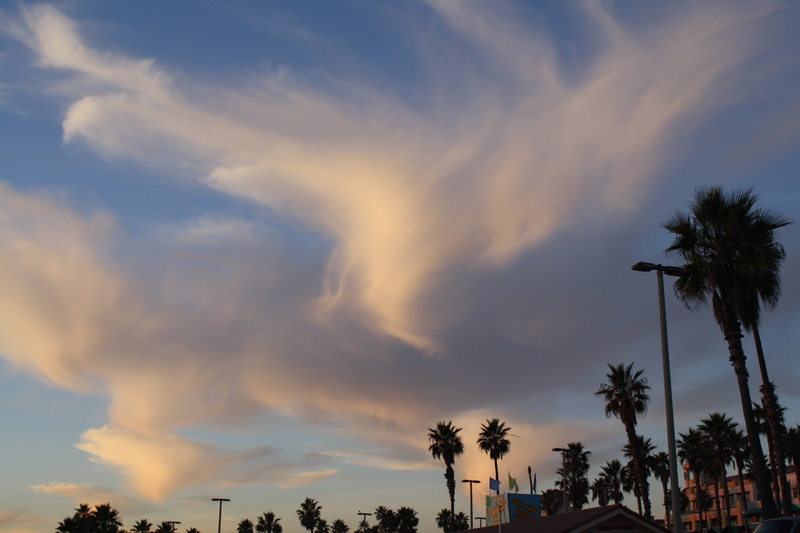 (We ended up going to the night launch of the Space Shuttle Endeavor while we were there.) Back in August, I had contacted them to see about transferring the tickets to Disneyland, and they did! 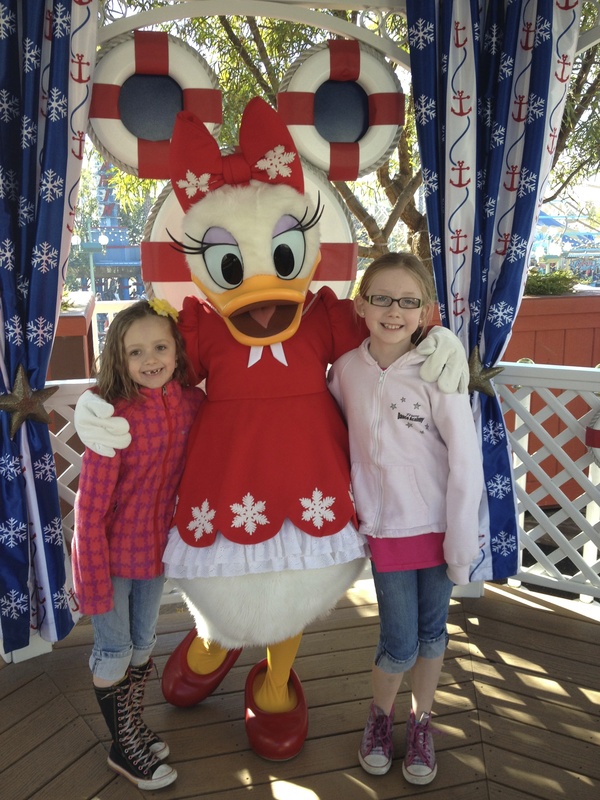 They also honoured the price of the original tickets, saying, “We would never penalize your children for growing up!” This meant that we only had to buy tickets this time for the two girls for two days, thankfully, as Disney is not cheap. At the Welcome Centre, they had been given advice to be at the park as much before the 8am opening as possible, as they were expecting a near-to-full capacity day. Full breakfast was included in the price of our hotel, but because it was Sunday, it wasn’t served until 7am, and we wanted to be walking to the park by then. As usual, we were running behind, so Alex was able to grab a cinnamon bun for the road and the rest of us had a quick bite in our room. 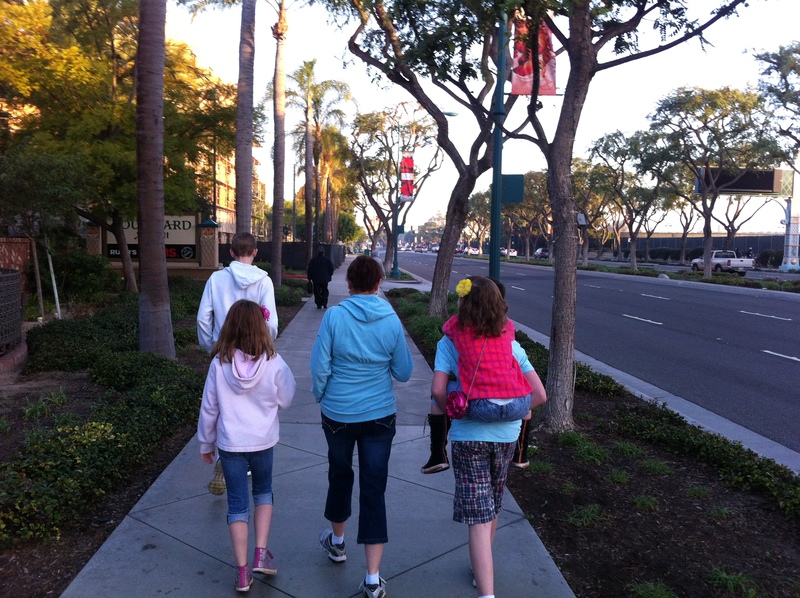 Our early morning walk in Anaheim. Excited for the day ahead. 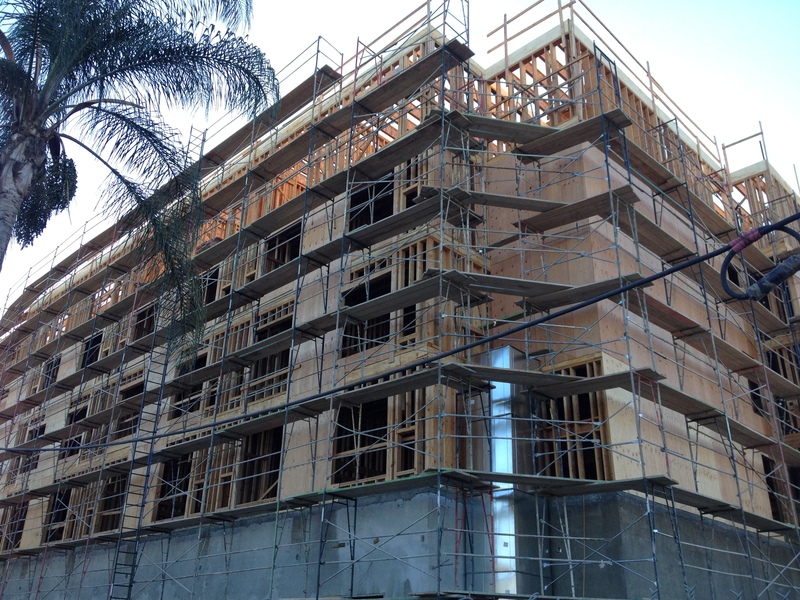 It was fun to see the palm trees and experience the new landscape. 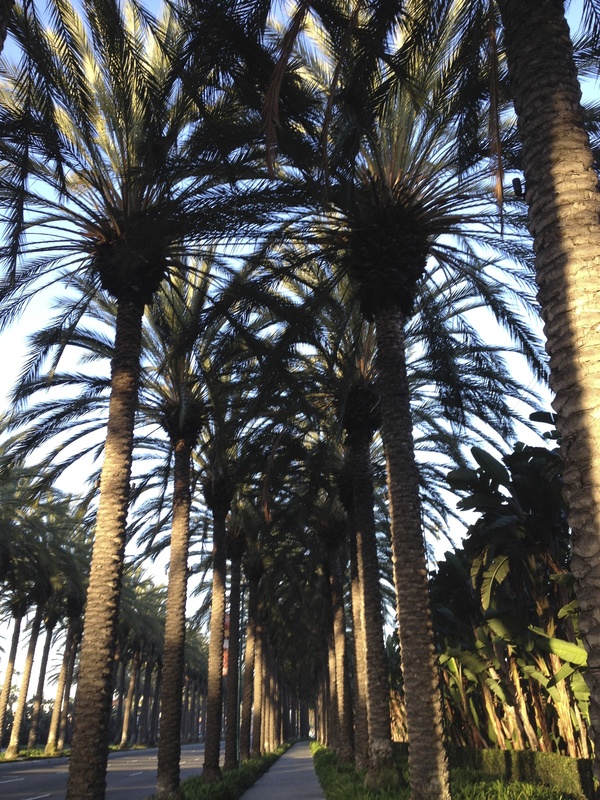 Beautiful palm trees, providing the street & sidewalk with shade. 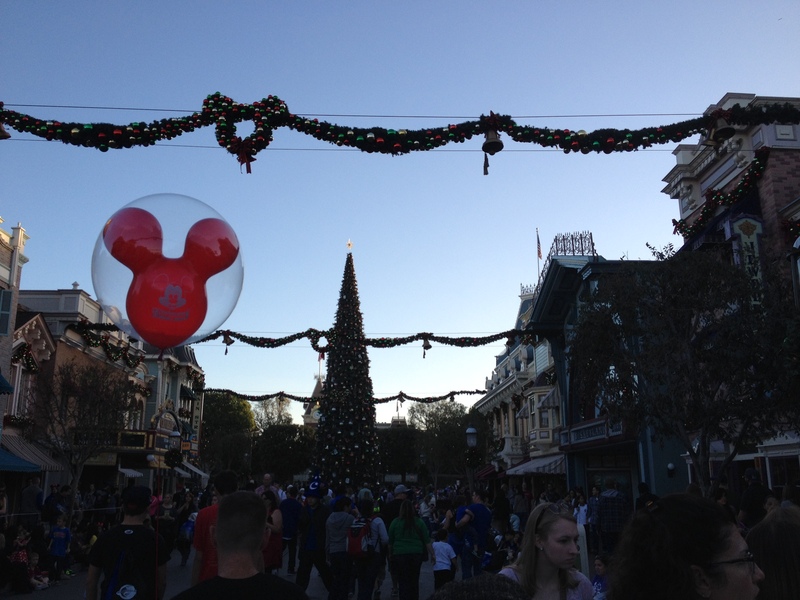 As we entered, Main Street was beautifully decorated for Christmas. 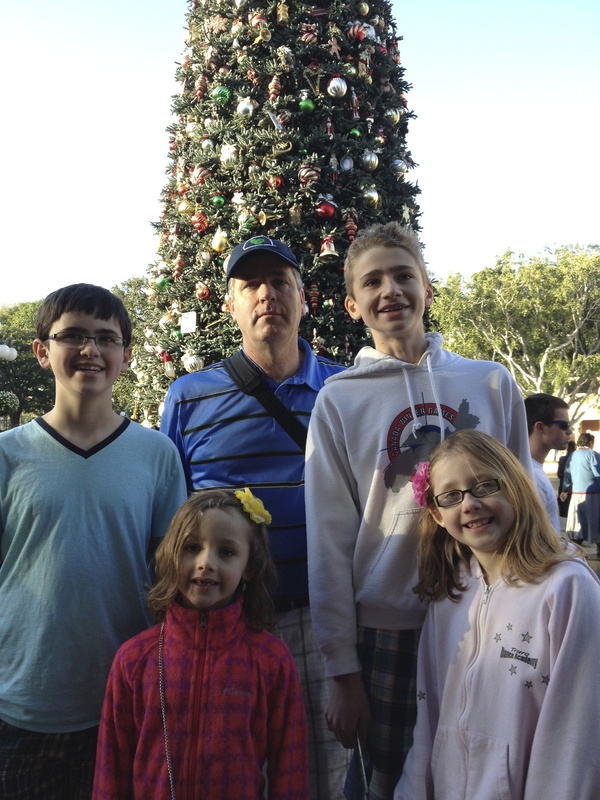 We stopped at the Christmas tree to get a photo, and are still teasing D’Arcy that he looks pretty cranky for someone at the happiest place on earth. 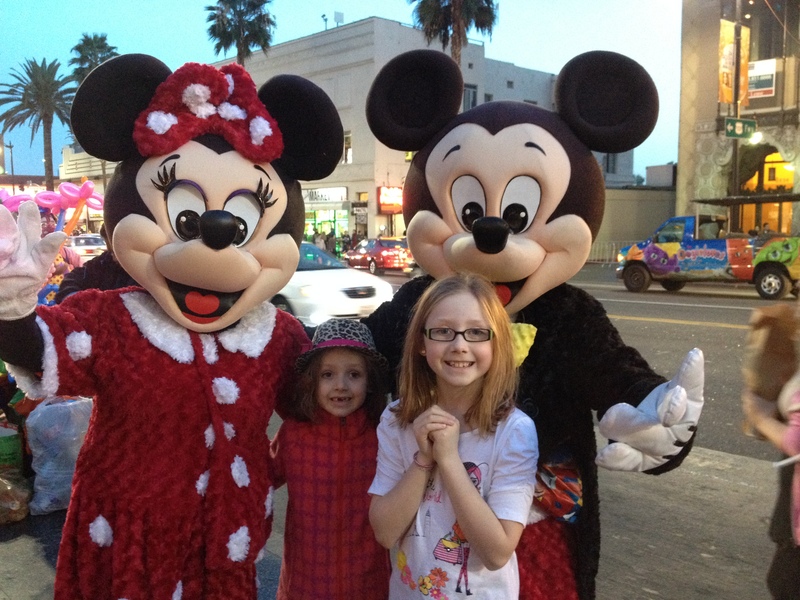 We saw Mickey Mouse and debated getting into the line to get our photo taken, but decided that it wasn’t worth it. We were sure we’d see him again at some point. Instead, we went straight to Space Mountain to pick up our “Fast Passes” to ride without waiting in line, stopping quickly to take the girls’ photo in the sunshine in front of Sleeping Beauty’s castle. At that time, the wait for Space Mountain was listed at 15 minutes and we should have ridden it right then, but I wasn’t in amusement-park-efficiency-mode yet. We pocketed our fast passes and made our way to the Matterhorn Bobsleds and got into that line which was only a few minutes long. We were happy we had waited this long to take the girls to Disney as they were mature enough and tall enough to ride all the rides. They LOVED the rollercoasters and the look on their faces in the various photos over the two days was priceless! 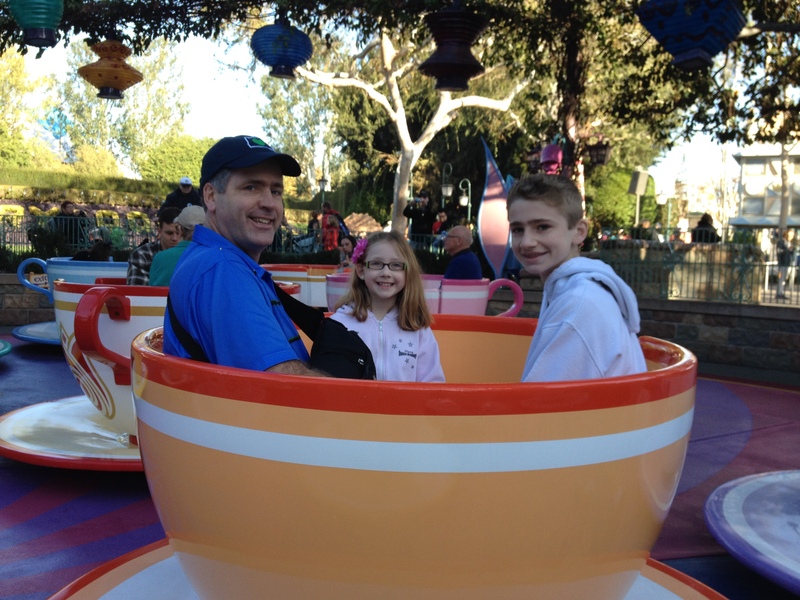 After the Matterhorn, we rode the teacups, the Alice in Wonderland ride, and then went to Autopia. Sarah was tall enough to have her own car, but stalled it on at least one occasion. Olivia was my driver (she was in charge of the steering wheel) and got annoyed with me if I lifted my foot from the gas. It was fun. 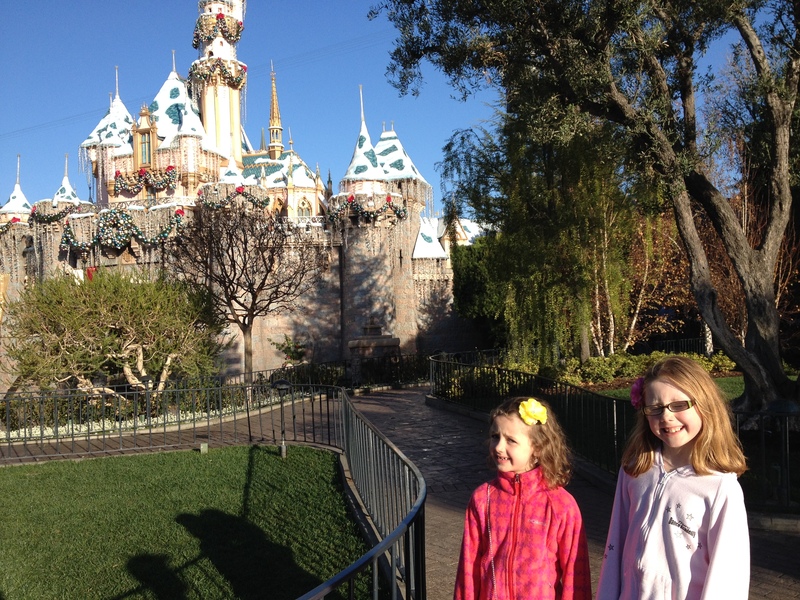 Our princesses in the sun in front of Sleeping Beauty’s Castle. By this time, our fast pass return time had arrived, so we went to Space Mountain and bypassed the line which was by then up to 40 minutes wait. Space Mountain is a ride that is found in Magic Kingdom in both Florida and California, but each is slightly different. We agreed that we found the California Space Mountain better and more intense. As we got off, we were all laughing and collected another fast pass so that we could ride again in the afternoon. 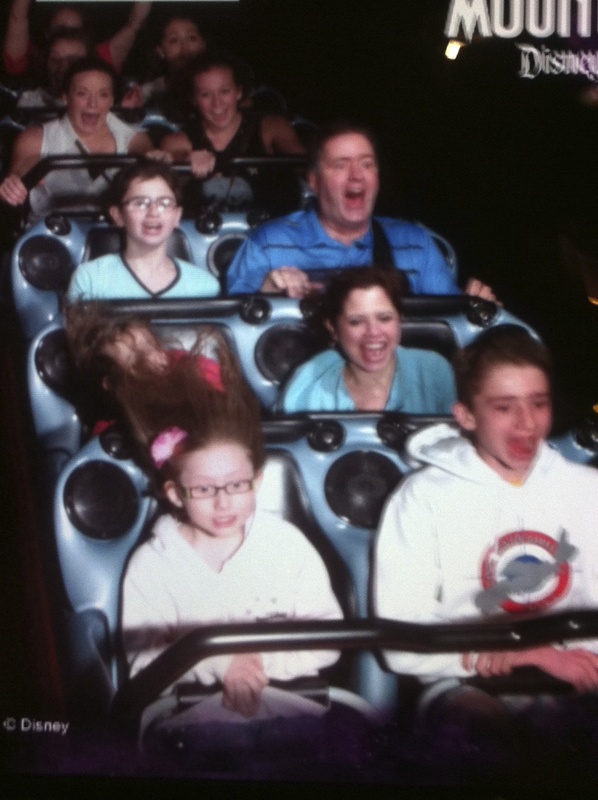 This photo of us on Space Mountain is my favourite – the expression on Sarah’s face is priceless!! We wandered through the thickening crowds, over to the other side of the park, stopping for a snack and some water along the way. As we were eating, we dropped some crumbs on the ground, and a cast member came along and swept them up right then and there! 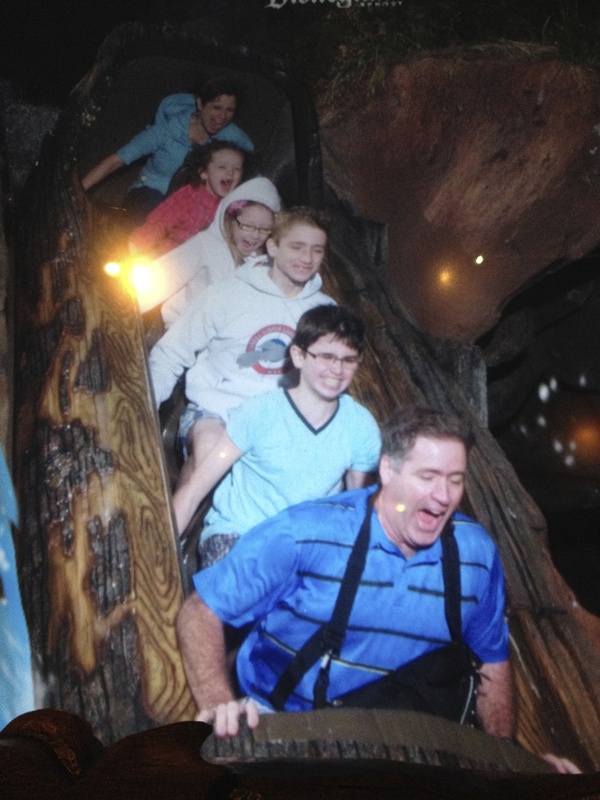 Next, we went to Splash Mountain and waited in a line there. It’s always interesting to watch the people around and how they experience the park. Personally, I can’t imagine going to Disney with very young children. In my opinion, it would be a nightmare maneuvering strollers, and watching that they don’t get lost in the crowd. We reiterated to the kids that if we were to get separated, then they were to stay still and we would come find them. When we got off that ride, Winnie the Pooh, Tigger, and Eyeore were out in Pooh Corner and the girls wanted to get photos with them. We tried to convince them that the line wasn’t worth it, but Olivia was insisting. As we got into line, the boys went off to see about getting fast passes to Indiana Jones. While we were in line, the characters switched out and Tigger and Eyeore went inside, and Rabbit replaced them. Olivia was happy enough to leave the line and do some shopping instead. We looked around in the gift shop, but did not buy anything. Outside the shop, there was one of those machines where you can put in a penny, and it will press it with a design. Each girl spent 51 cents to get a penny pressed with a Winnie-the-Pooh character. That was the extent of our souvenir shopping the first day. By this time, the park was very crowded and we were getting hungry for lunch. 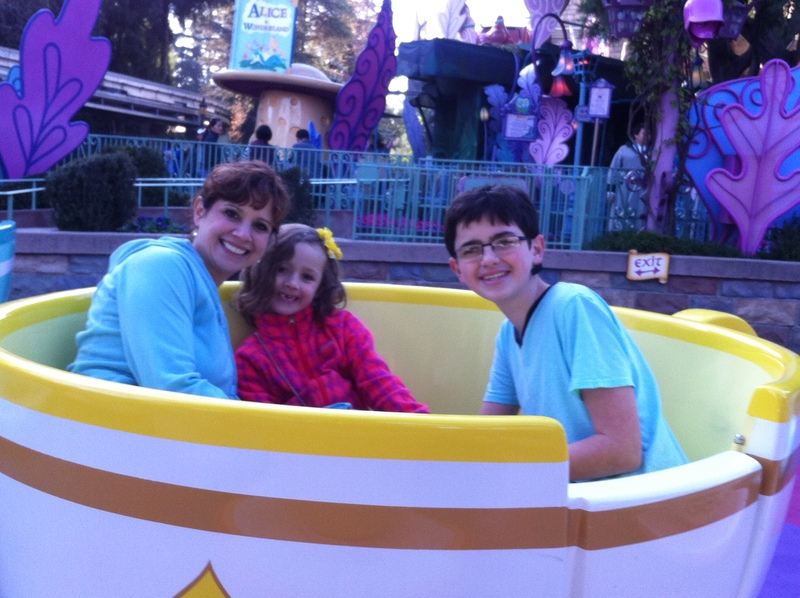 Disney is known in the food allergy community for being one of the safest places to take your food-allergic child. Each restaurant is knowledgeable and aware. We checked a couple that I had read about online, and ended up at the Village Haus near the carousel where we were able to get a decent, mostly healthy lunch for the six of us for $69. It felt good to sit down. Olivia had a pure beef burger on a whole wheat bun with carrot sticks and apple slices. I had a delicious flatbread with tomatoes, garlic, smoked bacon, caramelized onions, basil and cheese. After lunch, we made a bathroom stop, and by this time it was downright crowded. We had to be careful that the adults didn’t run over the kids after one woman elbowed Sarah in the head. 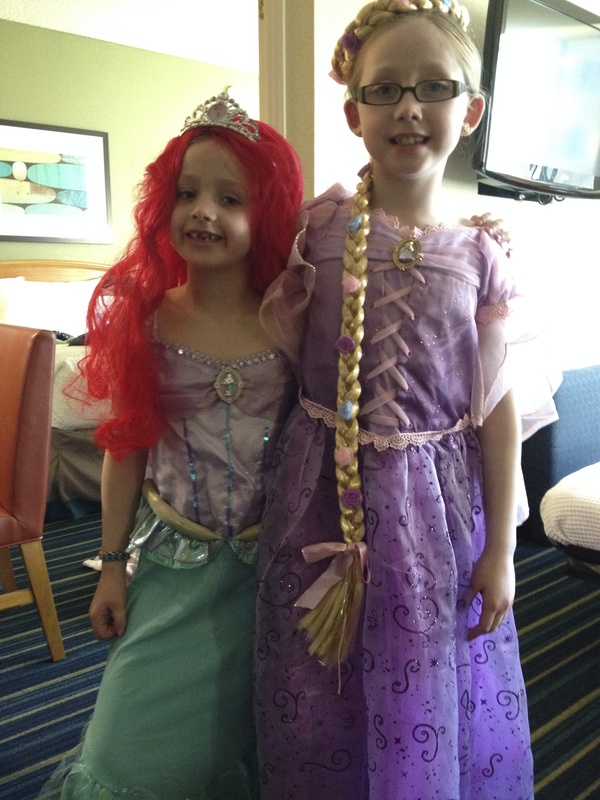 She wasn’t fazed as much as I was though, because she saw Elsa and Anna from the new Disney production, “Frozen”. We got out of that area as quickly as we could and headed back toward Tomorrowland and Fantasyland. Along the way, we stopped to watch a high school marching band from Alabama who would be taking part in the Rose Bowl Parade. There were a few hundred kids involved – they were amazing! We walked toward “It’s a Small World”, but the wait was estimated to be an hour long. We watched part of a stage show featuring singing and dancing by different Disney princesses: Jasmine, Rapunzel, and Pocahontas. Then there was a “Little Mermaid” medley. We went back to the Matterhorn and waited 35 minutes to ride it again before going to the Innovations exhibit. It’s like the Discovery Centre in Halifax, but on steroids. 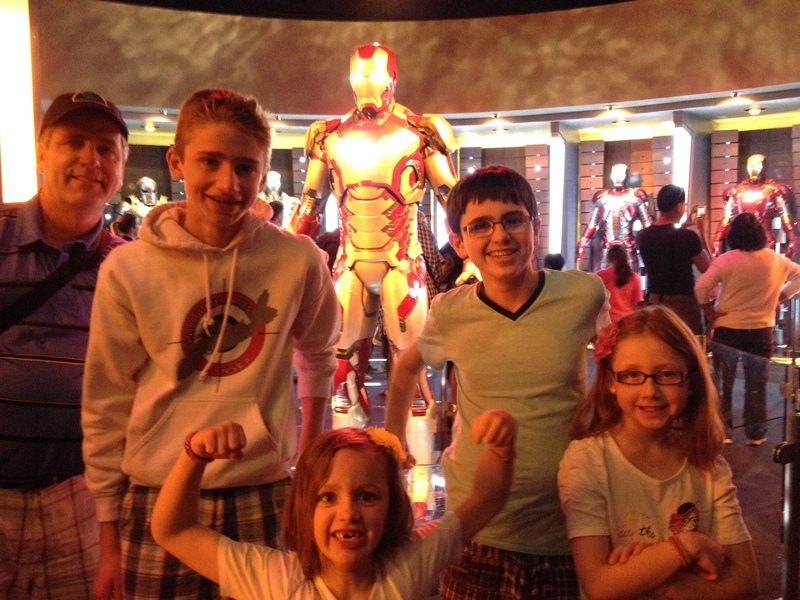 The girls, for whatever reason, were intrigued by the “Iron Man” exhibit of his costume over the years. One area was set up with Playstations, although I can’t imagine why you’d pay money to go to Disneyland and then spend your time playing on a Playstation. Call me crazy. 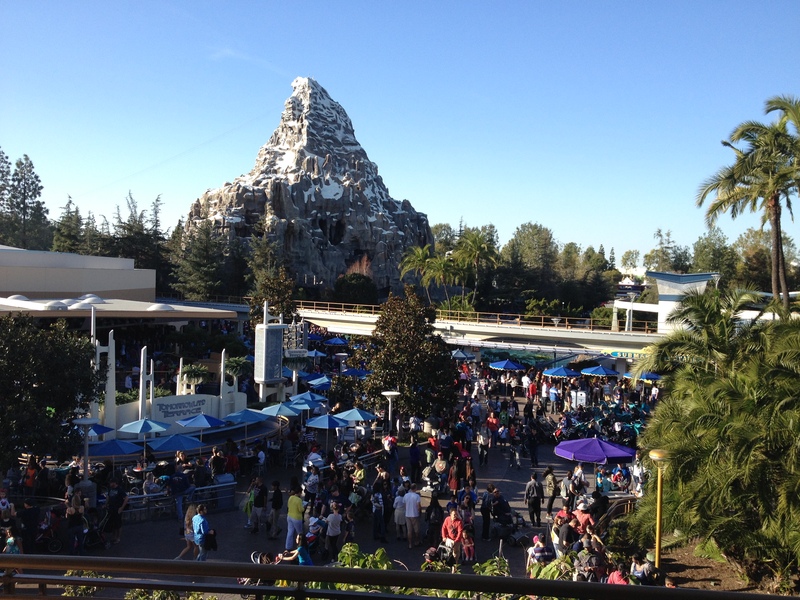 A view of the Matterhorn and some of the crowds from the balcony at Innovations. When we left Innovations, it was almost the time that we could redeem our fast pass for Space Mountain, so we stopped next door at the “Captain EO” 4D short film. It was fun to see a young Michael Jackson and feel the seats move under us. Olivia kept reaching out, trying to grab the 3D effects. 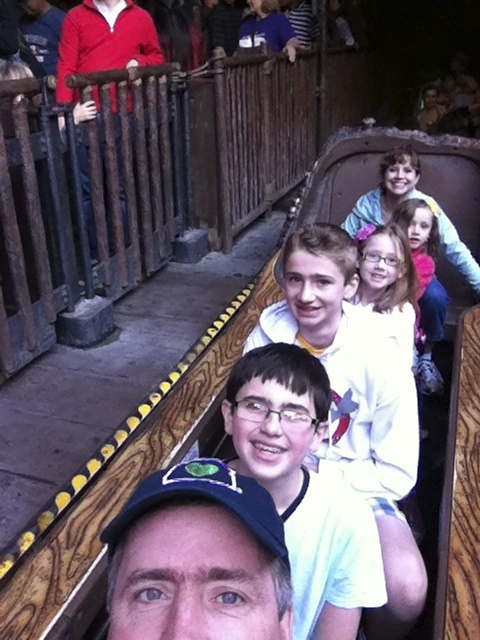 Our second trip on Space Mountain was fun as well, but when it was over we were ready for a break. It was late afternoon by this time and we made the half-hour walk back to our hotel. When we got there, we all chilled out for a while. Evan wasn’t feeling well; fighting a cold, so I gave him an antihistamine and some advil. D’Arcy went to the grocery store while I took the kids to the pool which was something I had promised them we’d do when they went to bed the night before. The boys played some basketball with kids from another family of four and then we all got into the hot tub. Upstairs, we had what we call a “munchie supper” of ham, grapes, apples, clementines, crackers, and cheese before playing Uno. We all decided we were too tired to go back to Disneyland for the fireworks, so had an early night to get ready for California Adventure Park the next morning, instead. Main Street USA on the way out. The girls would have liked a balloon, but understood we could not take it on the plane. Take 2 – in front of the tree on the way out. Happier now. It was a magical day; the decorations were amazing and it was nice to hear Christmas music being piped through the speakers as we walked through the park, making a festive holiday atmosphere. 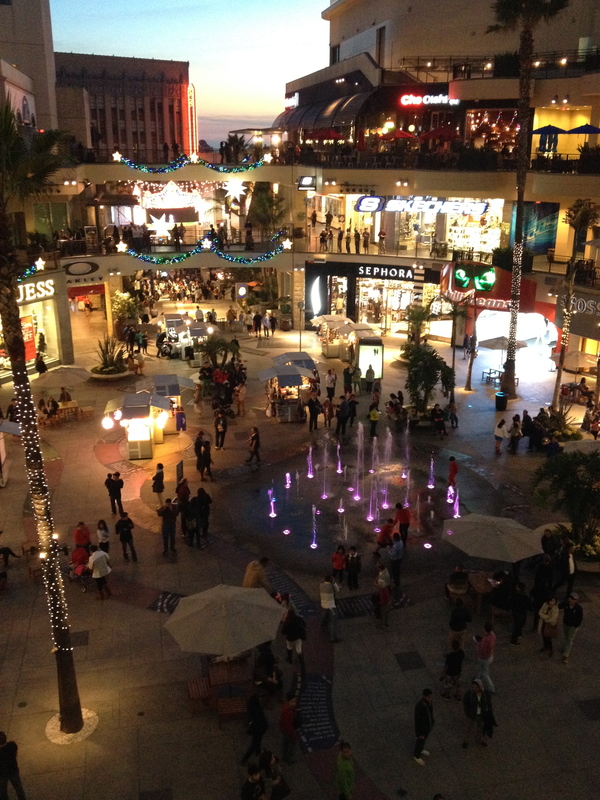 However, if we were to go back again, I would avoid Christmas week and the excessive crowds.